Colin Norman is an astrophysicist interested in twin approaches to his chosen field of astronomy and astrophysics: (1) Traditional detailed mathematical physics- based descriptions of astronomical phenomena and (2) Large Space projects where frontier technology meets the rigors of space based projects. Truly fundamental progress has been made in the field using both these approaches over the last decades. Colin’s interests are listed in the short form CV below and the link to his publications is also given. He has many outstanding collaborators spread over the globe whom - he acknowledges with gratitude - greatly enhance his thinking. Their names are in the publications link below. 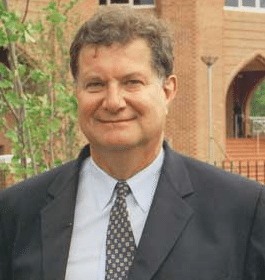 Dr. Norman was educated at Melbourne University for undergraduate studies and at Oxford for his D.Phil. He has held appointments at Oxford, Cambridge, Leiden, Munich, Johns Hopkins University and the Space Telescope Science Institute. He has held many fellowships and visiting appointments at major centres in astrophysics, these are listed in the attached short CV. Prof. Norman is most happy at work while discussing fundamental problems in astronomy and astrophysics with brilliant young grad students and postdoctoral fellows (and faculty colleagues!) who come into his office with interesting questions. Colin Norman’s family and friends are his main interest outside astrophysics but he also enjoys cycling in the country, surfing and windsurfing, walking and jogging (formerly running! ), playing golf (badly! ), playing Bach keyboard music and attending good opera. Current Research Interests in 2017-18. Below are many topics for student and postdoctoral fellow collaboration. I have published papers recently, or have papers in preparation, on all these topics and can certainly provide more information. Sc Galaxies and Dark Matter. 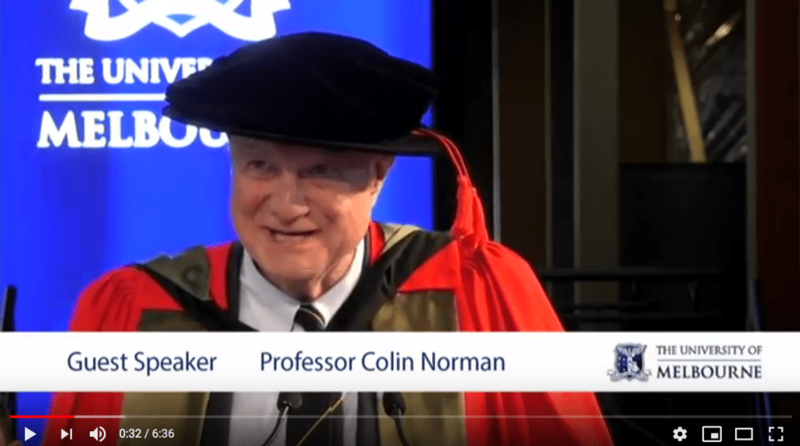 Click the image above to watch a video of Prof. Norman's speech. Since I received my undergraduate degree here 49 years ago, many of the discoveries in astronomy and astrophysics have entered the culture. We know there was a definite beginning to our universe about fourteen billion years ago. We know everything is evolving, from the universe itself, its stars, its galaxies, all the way to the intricate evolution of the domain of life. Additionally, we know the matter and energy constituting the universe is predominantly made up of dark matter and dark energy and its nature is consequently unknown. Only about 5% of all matter is observable to us with existing telescopes. Astonishingly, all massive galaxies have central black holes - singularities in the fabric of space and time - and the influence of these tiny, but massive, objects on the structure of the galaxies themselves is profound. Black holes on even smaller scales have been now observed to merge, leading to brilliant measurements of the associated gravitational wave signals. The younger generation are intensely focused on habitable earth-like planets orbiting around other stars. Based on discoveries made since this graduating class was born, we project that every star in the universe has at least a 1-10% chance of harboring a potentially habitable earth-like planet. The advances during this so-called golden age of astronomy and astrophysics are increasingly rapid and the spread of knowledge into the broad cultural awareness is also speedy. There are three obvious cultural perspectives here: (1) we may well be able to find other habitable planets to occupy over the long reaches of time that our human civilization may survive, (2) we may well not be alone and unique, and (3) the more we study Earth and other exoplanets the more we are aware of huge changes of planet climate, planet surface, planet oceans. In fact, what we call “global warming” is a relatively small change for our planet Earth but we do need to get though it to continue the adventure of our human species, and I am optimistic that our human genius for survival will prevail. Returning now to education for a moment. The true measure of any great society - such as we have here in Melbourne - is how it educates its youth. The great teaching ethos here at Melbourne continues to be superb. My only regret is that it is not still free to all who merit admission as it was in those postwar years where the hope of our society lay in educating the next generation - across all strata - to do better. You graduate from this great university as well educated as any similar group on the planet. Be confident that you can achieve wonderful things. It used to be traditional at Melbourne to enter the professions of law, engineering, medicine, business etc. Fifty years ago there were less adventurous options. In this great multicultural affluent highly-educated society in Melbourne (and other global centers) you can afford to take risks and explore fascinating and adventurous career paths over a lifetime. When things go well in life - for example, in space missions such as the Hubble Space Telescope and in science and technical research in general - it is all sunshine. This is not always so. Character is needed to survive the inevitable setbacks and even catastrophes. Always keep the balanced perspective and try to remember there are times for victories and at other times there are defeats and these are important and expected markers in one’s life. What’s most important is to understand and remember and be grateful for the very real and fundamentally important inspiration and loyal support of family, friends and colleagues in this great life adventure. Do not imagine you can, or should, “go it alone”. Congratulations to you on your graduation and best wishes and good luck to you in your future great endeavors. Chiaberge M, Tremblay GR, Capetti A, Norman C. The recoiling black hole candidate 3C 186: Spatially-resolved quasar feedback and further evidence of a blue-shifted broad line region. eprint arXiv:1805 05860. 2018:arXiv:1805.05860. https://ui.adsabs.harvard.edu/#abs/2018arXiv180505860C. Kelly PL, Diego JM, Rodney S, et al. Extreme magnification of an individual star at redshift 1.5 by a galaxy-cluster lens. Nature Astronomy, Volume 2, p 334-342. 2018;2:334-342. https://ui.adsabs.harvard.edu/#abs/2018NatAs...2..334K. doi: 10.1038/s41550-018-0430-3. Schneider FRN, Sana H, Evans CJ, et al. VizieR online data catalog: Massive stars in 30 dor (schneider+, 2018). VizieR On-line Data Catalog: J/other/Sci/359 69 Originally published in: 2018Sci 359 69S. 2018;0210:J/other/Sci/359. https://ui.adsabs.harvard.edu/#abs/2018yCatp021035901S. Nanni R, Gilli R, Vignali C, et al. The 500 ks chandra observation of the z = 6.31 QSO SDSS J1030+0524. eprint arXiv:1802 05613. 2018:arXiv:1802.05613. https://ui.adsabs.harvard.edu/#abs/2018arXiv180205613N. Mazoyer J, Pueyo L, N'Diaye M, et al. Active correction of aperture discontinuities-optimized stroke minimization. I. A new adaptive interaction matrix algorithm. The Astronomical Journal, Volume 155, Issue 1, article id 7, 13 pp (2018). 2018;155:7. https://ui.adsabs.harvard.edu/#abs/2018AJ....155....7M. doi: 10.3847/1538-3881/aa91cf. Mazoyer J, Pueyo L, N'Diaye M, et al. Active correction of aperture discontinuities-optimized stroke minimization. II. optimization for future missions. The Astronomical Journal, Volume 155, Issue 1, article id 8, 19 pp (2018). 2018;155:8. https://ui.adsabs.harvard.edu/#abs/2018AJ....155....8M. doi: 10.3847/1538-3881/aa91d7. Schneider FRN, Sana H, Evans CJ, et al. An excess of massive stars in the local 30 doradus starburst. Science, Volume 359, Issue 6371, pp 69-71 (2018). 2018;359:69-71. https://ui.adsabs.harvard.edu/#abs/2018Sci...359...69S. doi: 10.1126/science.aan0106. Popping G, Puglisi A, Norman CA. Dissecting the IRX-β dust attenuation relation: Exploring the physical origin of observed variations in galaxies. Monthly Notices of the Royal Astronomical Society, Volume 472, Issue 2, p 2315-2333. 2017;472:2315-2333. https://ui.adsabs.harvard.edu/#abs/2017MNRAS.472.2315P. doi: 10.1093/mnras/stx2202. Mazoyer J, Pueyo L, N'Diaye M, et al. Capabilities of ACAD-OSM, an active method for the correction of aperture discontinuities. eprint arXiv:1710 03512. 2017:arXiv:1710.03512. https://ui.adsabs.harvard.edu/#abs/2017arXiv171003512M. Bordoloi R, Wagner AY, Heckman TM, Norman CA. The formation and physical origin of highly ionized cooling gas. The Astrophysical Journal, Volume 848, Issue 2, article id 122, 15 pp (2017). 2017;848:122. https://ui.adsabs.harvard.edu/#abs/2017ApJ...848..122B. doi: 10.3847/1538-4357/aa8e9c. Crosley MK, Osten RA, Norman C. Transient mass-loss analysis of solar observations using stellar methods. The Astrophysical Journal, Volume 845, Issue 1, article id 67, 14 pp (2017). 2017;845:67. https://ui.adsabs.harvard.edu/#abs/2017ApJ...845...67C. doi: 10.3847/1538-4357/aa7edc. Almeida LA, Sana H, Taylor W, et al. VizieR online data catalog: OB-type spectroscopic binaries (almeida+, 2017). VizieR On-line Data Catalog: J/A+A/598/A84 Originally published in: 2017A&A 598A 84A. 2017:J/A+A/598/A84. https://ui.adsabs.harvard.edu/#abs/2017yCat..35980084A. Gilli R, Calura F, D'Ercole A, Norman C. Exponentially growing bubbles around early supermassive black holes. Astronomy & Astrophysics, Volume 603, id A69, 17 pp. 2017;603:A69. https://ui.adsabs.harvard.edu/#abs/2017A&A...603A..69G. doi: 10.1051/0004-6361/201730457. Chiaberge M, Ely JC, Meyer ET, et al. The puzzling case of the radio-loud QSO 3C 186: A gravitational wave recoiling black hole in a young radio source? Astronomy & Astrophysics, Volume 600, id A57, 15 pp. 2017;600:A57. https://ui.adsabs.harvard.edu/#abs/2017A&A...600A..57C. doi: 10.1051/0004-6361/201629522. Almeida LA, Sana H, Taylor W, et al. The tarantula massive binary monitoring. I. observational campaign and OB-type spectroscopic binaries. Astronomy & Astrophysics, Volume 598, id A84, 36 pp. 2017;598:A84. https://ui.adsabs.harvard.edu/#abs/2017A&A...598A..84A. doi: 10.1051/0004-6361/201629844. Meyer E, Sparks W, Georganopoulos M, et al. Proper motions of jets on the kiloparsec scale: New results with HST. Galaxies, vol 5, issue 1, p 8. 2017;5:8. https://ui.adsabs.harvard.edu/#abs/2017Galax...5....8M. doi: 10.3390/galaxies5010008. Mazoyer J, Pueyo L, N'Diaye M, et al. A new active method to correct for the effects of complex apertures on coronagraph performance. American Astronomical Society, AAS Meeting #229, id 206 03. 2017:206.03. https://ui.adsabs.harvard.edu/#abs/2017AAS...22920603M. Crosley MK, Osten RA, Broderick JW, et al. The search for signatures of transient mass loss in active stars. The Astrophysical Journal, Volume 830, Issue 1, article id 24, 11 pp (2016). 2016;830:24. https://ui.adsabs.harvard.edu/#abs/2016ApJ...830...24C. doi: 10.3847/0004-637X/830/1/24. Mazoyer J, Pueyo L, N'Diaye M, Mawet D, Soummer R, Norman C. Correcting for the effects of pupil discontinuities with the ACAD method. Proceedings of the SPIE, Volume 9904, id 99044T 12 pp (2016). 2016;9904:99044T. https://ui.adsabs.harvard.edu/#abs/2016SPIE.9904E..4TM. doi: 10.1117/12.2232907. Davis JH, Silk J, BÅ`hm C, Kotera K, Norman C. Shocking signals of dark matter annihilation. Physical Review D, Volume 93, Issue 10, id 103523. 2016;93:103523. https://ui.adsabs.harvard.edu/#abs/2016PhRvD..93j3523D. doi: 10.1103/PhysRevD.93.103523. Meyer ET, Georganopoulos M, Sparks WB, et al. An HST proper-motion study of the optical jet in 3C 264: Direct evidence for the internal shock model. American Astronomical Society, HEAD meeting #15, id 100 01. 2016;15:100.01. https://ui.adsabs.harvard.edu/#abs/2016HEAD...1510001M. Georganopoulos M, Meyer E, Sparks WB, et al. Uncovering nature’s 100 TeV particle accelerators in the large-scale jets of quasars. American Astronomical Society, HEAD meeting #15, id 106 17. 2016;15:106.17. https://ui.adsabs.harvard.edu/#abs/2016HEAD...1510617G. Mazoyer J, Pueyo L, Norman C, N'Diaye M, van dM, Soummer R. Active compensation of aperture discontinuities for WFIRST-AFTA: Analytical and numerical comparison of propagation methods and preliminary results with a WFIRST-AFTA-like pupil. Journal of Astronomical Telescopes, Instruments, and Systems, Volume 2, id 011008 (2016). 2016;2:011008. https://ui.adsabs.harvard.edu/#abs/2016JATIS...2a1008M. doi: 10.1117/1.JATIS.2.1.011008. Meyer ET, Sparks WB, Georganopoulos M, et al. An HST proper-motion study of the large-scale jet of 3C273. The Astrophysical Journal, Volume 818, Issue 2, article id 195, 12 pp (2016). 2016;818:195. https://ui.adsabs.harvard.edu/#abs/2016ApJ...818..195M. doi: 10.3847/0004-637X/818/2/195. Srivastava D, Norman C, Azough F, et al. Tuning the thermoelectric properties of A-site deficient SrTiO3ceramics by vacancies and carrier concentration. Phys Chem Chem Phys , vol 18, issue 38, pp 26475-26486. 2016;18:26475-26486. https://ui.adsabs.harvard.edu/#abs/2016PCCP...1826475S. doi: 10.1039/C6CP05523K. Gilli R, Norman CA, Vignali C. ALMA reveals a compact starburst around a hidden QSO at z̃5. Revolution in Astronomy with ALMA: The Third Year Proceedings of a Conference held at the Tokyo International Forum, Tokyo, Japan 8-11 December 2014 Edited by Daisuke Iono, Ken-ichi Tatematsu, Alwyn Wootten, and Leonardo Testi ASP Conference Series Vol 499 San Francisco: Astronomical Society of the Pacific, 2015, p 17. 2015;499:17. https://ui.adsabs.harvard.edu/#abs/2015ASPC..499...17G. Almeida LA, Sana H, de Mink SE, et al. Discovery of the massive overcontact binary VFTS352: Evidence for enhanced internal mixing. The Astrophysical Journal, Volume 812, Issue 2, article id 102, 9 pp (2015). 2015;812:102. https://ui.adsabs.harvard.edu/#abs/2015ApJ...812..102A. doi: 10.1088/0004-637X/812/2/102. Mazoyer J, Pueyo L, Norman C, et al. Active correction of aperture discontinuities (ACAD) for space telescope pupils: A parametic analysis. Proceedings of the SPIE, Volume 9605, id 96050M 13 pp (2015). 2015;9605:96050M. https://ui.adsabs.harvard.edu/#abs/2015SPIE.9605E..0MM. doi: 10.1117/12.2188692. Chiaberge M, Norman C, Gilli R, Lotz J. RADIO LOUD AGNs are mergers. Demographics and Environment of AGN from Multi-Wavelength Surveys, Proceedings of a conference held 21-24 September, 2015 on Crete Island, Chania Online at http://xraygroup.astro.noa.gr/, id 19. 2015:19. https://ui.adsabs.harvard.edu/#abs/2015deam.confE..19C. Chiaberge M, Gilli R, Lotz JM, Norman C. Radio loud AGNs are mergers. The Astrophysical Journal, Volume 806, Issue 2, article id 147, 16 pp (2015). 2015;806:147. https://ui.adsabs.harvard.edu/#abs/2015ApJ...806..147C. doi: 10.1088/0004-637X/806/2/147. Meyer ET, Georganopoulos M, Sparks WB, et al. A kiloparsec-scale internal shock collision in the jet of a nearby radio galaxy. Nature, Volume 521, Issue 7553, pp 495-497 (2015). 2015;521:495-497. https://ui.adsabs.harvard.edu/#abs/2015Natur.521..495M. doi: 10.1038/nature14481. Pueyo L, Norman CA, Soummer R, Perrin MD, N'Diaye M, Choquet E. High contrast imaging with an arbitrary aperture: Active correction of aperture discontinuities: Fundamental limits and practical trades offs. American Astronomical Society, AAS Meeting #225, id 338 26. 2015:338.26. https://ui.adsabs.harvard.edu/#abs/2015AAS...22533826P. Meyer ET, Georganopoulos M, Sparks WB, et al. Superluminal motions at 500 mpc: New results on nearby AGN jets with HST. American Astronomical Society, AAS Meeting #225, id 120 03. 2015:120.03. https://ui.adsabs.harvard.edu/#abs/2015AAS...22512003M. Castignani G, Chiaberge M, Celotti A, Norman C, De Zotti G. Cluster candidates around low-power radio galaxies at z ~ 1-2 in COSMOS. The Astrophysical Journal, Volume 792, Issue 2, article id 114, 27 pp (2014). 2014;792:114. https://ui.adsabs.harvard.edu/#abs/2014ApJ...792..114C. doi: 10.1088/0004-637X/792/2/114. Castignani G, Chiaberge M, Celotti A, Norman C. A new method to search for high-redshift clusters using photometric redshifts. The Astrophysical Journal, Volume 792, Issue 2, article id 113, 28 pp (2014). 2014;792:113. https://ui.adsabs.harvard.edu/#abs/2014ApJ...792..113C. doi: 10.1088/0004-637X/792/2/113. Pueyo L, Norman C, Soummer R, et al. High contrast imaging with an arbitrary aperture: Active correction of aperture discontinuities: Fundamental limits and practical trade- offs. Proceedings of the SPIE, Volume 9143, id 914321 15 pp (2014). 2014;9143:914321. https://ui.adsabs.harvard.edu/#abs/2014SPIE.9143E..21P. doi: 10.1117/12.2056925. Norman C. Final thoughts…. The First Billion Years of Galaxies and Black Holes, Proceedings of the Conference held 30 June - 4 July, 2014 in Sesto (BZ), Italy Online at: http://adsabs.harvard.edu/abs/2014fbyg.confE...1E, id 32. 2014:32. https://ui.adsabs.harvard.edu/#abs/2014fbyg.confE..32N. Boehm C, Gondolo P, Jean P, Lacroix T, Norman C, Silk J. A possible link between the GeV excess and the 511 keV emission line in the galactic centre. eprint arXiv:1406 4683. 2014:arXiv:1406.4683. https://ui.adsabs.harvard.edu/#abs/2014arXiv1406.4683B. Choquet E, N'Diaye M, Pueyo L, et al. High-contrast imaging testbed for complex aperture telescopes (HiCAT) for future space missions. Search for Life Beyond the Solar System Exoplanets, Biosignatures & Instruments Online at http://wwwebi2014 org, id P4 85. 2014:P4.85. https://ui.adsabs.harvard.edu/#abs/2014ebi..confP4.85C. Gilli R, Norman C, Vignali C, et al. ALMA reveals a warm and compact starburst around a heavily obscured supermassive black hole at z = 4.75. Astronomy & Astrophysics, Volume 562, id A67, 11 pp. 2014;562:A67. https://ui.adsabs.harvard.edu/#abs/2014A&A...562A..67G. doi: 10.1051/0004-6361/201322892. Meyer ET, Sparks WB, Biretta JA, et al. "New proper motion measurements of the superluminal velocities in the M87 optical jet with HST". American Astronomical Society, AAS Meeting #223, id 210 05. 2014:210.05. https://ui.adsabs.harvard.edu/#abs/2014AAS...22321005M. N'Diaye M, Choquet E, Pueyo L, et al. High-contrast imager for complex aperture telescopes (HiCAT): Testbed design and coronagraph developments. American Astronomical Society, AAS Meeting #223, id 149 13. 2014:149.13. https://ui.adsabs.harvard.edu/#abs/2014AAS...22314913N. Pueyo L, Norman C, Soummer R, Perrin M, N'Diaye M, Choquet E. High contrast imaging with an arbitrary aperture: Active correction of aperture discontinuities. Proceedings of the Third AO4ELT Conference Firenze, Italy, May 26-31, 2013, Eds : Simone Esposito and Luca Fini Online at https://ao4elt3.sciencesconf.org/, id 84. 2013:84. https://ui.adsabs.harvard.edu/#abs/2013aoel.confE..84P. doi: 10.12839/AO4ELT3.13373. Pueyo L, Norman C, Soummer R, Perrin M, N'Diaye M, Choquet E. High-contrast imaging with an arbitrary aperture: Active correction of aperture discontinuities. Proceedings of the SPIE, Volume 8864, id 88640Z 16 pp (2013). 2013;8864:88640Z. https://ui.adsabs.harvard.edu/#abs/2013SPIE.8864E..0ZP. doi: 10.1117/12.2025123. Meyer ET, Sparks WB, Biretta JA, et al. Optical proper motion measurements of the M87 jet: New results from the hubble space telescope. The Astrophysical Journal Letters, Volume 774, Issue 2, article id L21, 6 pp (2013). 2013;774:L21. https://ui.adsabs.harvard.edu/#abs/2013ApJ...774L..21M. doi: 10.1088/2041-8205/774/2/L21. Pueyo L, Norman C. High-contrast imaging with an arbitrary aperture: Active compensation of aperture discontinuities. The Astrophysical Journal, Volume 769, Issue 2, article id 102, 31 pp (2013). 2013;769:102. https://ui.adsabs.harvard.edu/#abs/2013ApJ...769..102P. doi: 10.1088/0004-637X/769/2/102. Meyer ET, Sparks WB, Van DM, et al. Proper motion and relativistic velocities in the optical synchrotron jet of M87. American Astronomical Society, HEAD meeting #13, id 101 08. 2013;13:101.08. https://ui.adsabs.harvard.edu/#abs/2013HEAD...1310108M. Gezari S, Chornock R, Rest A, et al. An ultraviolet-optical flare from the tidal disruption of a helium-rich stellar core. Nature, Volume 485, Issue 7397, pp 217-220 (2012). 2012;485:217-220. https://ui.adsabs.harvard.edu/#abs/2012Natur.485..217G. doi: 10.1038/nature10990. Gilli R, Su J, Norman C, et al. A compton-thick active galactic nucleus at z ~ 5 in the 4 ms chandra deep field south. The Astrophysical Journal Letters, Volume 730, Issue 2, article id L28, 5 pp (2011). 2011;730:L28. https://ui.adsabs.harvard.edu/#abs/2011ApJ...730L..28G. doi: 10.1088/2041-8205/730/2/L28. Mainieri V, Kellermann KI, Fomalont EB, et al. VizieR online data catalog: VLA survey of CDF-S. II. (mainieri+, 2008). VizieR On-line Data Catalog: J/ApJS/179/95 Originally published in: 2008ApJS 179 95M. 2010:J/ApJS/179/95. https://ui.adsabs.harvard.edu/#abs/2010yCat..21790095M. Langer N, Brott I, Cantiello M, et al. Massive stars as progenitors of SNe & GRBs. Progenitors and Environments of Stellar Explosions, XXVIth IAP Annual Colloquium held in Paris 28 June - 2 July, 2010 Online at http://wwwiap fr/col2010/scientific_programme html, id 17. 2010:17. https://ui.adsabs.harvard.edu/#abs/2010pese.confE..17L. Beaulieu SF, Freeman KC, Hidalgo SL, Norman CA, Quinn PJ. The recent star formation history of NGC 5102. The Astronomical Journal, Volume 139, Issue 3, pp 984-993 (2010). 2010;139:984-993. https://ui.adsabs.harvard.edu/#abs/2010AJ....139..984B. doi: 10.1088/0004-6256/139/3/984. Tozzi P, Kellermann K, Fomalont E, et al. VLA survey of the CDFS: The nature of faint radio sources. The Starburst-AGN Connection ASP Conference Series, Vol 408, proceedings of the conference held 27-31 October 2008, at Shanghai Normal University, Shanghai, China Edited by Weimin Wang, Zhaoqing Yang, Zhijian Luo, and Zhu Chen San Francisco: Astronomical Society of the Pacific, 2009 , p 53. 2009;408:53. https://ui.adsabs.harvard.edu/#abs/2009ASPC..408...53T. Miller NA, Fomalont EB, Kellermann KI, et al. VizieR online data catalog: VLA 1.4GHz survey of E-CDF-S (miller+, 2008). VizieR On-line Data Catalog: J/ApJS/179/114 Originally published in: 2008ApJS 179 114M. 2009:J/ApJS/179/114. https://ui.adsabs.harvard.edu/#abs/2009yCat..21790114M. Silk J, Norman C. Global star formation revisited. The Astrophysical Journal, Volume 700, Issue 1, pp 262-275 (2009). 2009;700:262-275. https://ui.adsabs.harvard.edu/#abs/2009ApJ...700..262S. doi: 10.1088/0004-637X/700/1/262. Tozzi P, Mainieri V, Rosati P, et al. The VLA survey of the chandra deep field-south. III. X-ray spectral properties of radio sources. The Astrophysical Journal, Volume 698, Issue 1, pp 740-755 (2009). 2009;698:740-755. https://ui.adsabs.harvard.edu/#abs/2009ApJ...698..740T. doi: 10.1088/0004-637X/698/1/740. Ptak A, Norman C, Heckman T. Wide area X-ray surveys for galaxies. American Astronomical Society, AAS Meeting #213, id 334 01. 2009:334.01. https://ui.adsabs.harvard.edu/#abs/2009AAS...21333401P. Miller NA, Fomalont EB, Kellermann KI, et al. The VLA 1.4 GHz survey of the extended chandra deep field-south: First data release. The Astrophysical Journal Supplement Series, Volume 179, Issue 1, pp 114-123 (2008). 2008;179:114-123. https://ui.adsabs.harvard.edu/#abs/2008ApJS..179..114M. doi: 10.1086/591054. Mainieri V, Kellermann KI, Fomalont EB, et al. The VLA survey of the chandra deep field-south. II. identification and host galaxy properties of submillijansky sources. The Astrophysical Journal Supplement Series, Volume 179, Issue 1, pp 95-113 (2008). 2008;179:95-113. https://ui.adsabs.harvard.edu/#abs/2008ApJS..179...95M. doi: 10.1086/591053. Murray SS, Norman C, Ptak A, et al. Wide field x-ray telescope mission. Space Telescopes and Instrumentation 2008: Ultraviolet to Gamma Ray Edited by Turner, Martin J L ; Flanagan, Kathryn A Proceedings of the SPIE, Volume 7011, article id 70111J, 16 pp (2008). 2008;7011:70111J. https://ui.adsabs.harvard.edu/#abs/2008SPIE.7011E..1JM. doi: 10.1117/12.789122. Tozzi P, Balestra I, Ettori S, et al. Evolution of the thermodynamical and chemical properties of the IntraCluster medium. "The X-ray Universe 2008" Symposium held in Granada, Spain, 27-30 May, 2008; Published online at https://wwwcosmos esa int/web/xmm-newton/2008-symposium, id 204". 2008:204. https://ui.adsabs.harvard.edu/#abs/2008xru..confE.204T. Norman CA, Team W. Wide field X-ray telescope. American Astronomical Society, HEAD meeting #10, id 37 07. 2008;10:37.07. https://ui.adsabs.harvard.edu/#abs/2008HEAD...10.3707N. Ptak A, Heckman T, Norman C, Hornschemeier A, Kewley L, Zesas A. The X-ray/SFR connection from X-ray observations oft the nearby field galaxy sample. ESAC faculty workshop on x-rays from nearby galaxies : Proceedings of ESAC faculty workshop on x-rays from nearby galaxies, European Space Agency, ESAC, Madrid (Spain), September 5-7,2007, Max-Planck-Institut für extraterrestrische Physik, MPE Report 295, ISSN 0178-0719, p 81-84,for article please contact:lib@mpa-garching mpg de;. 2008:81-84. https://ui.adsabs.harvard.edu/#abs/2008xng..conf...81P. Wada K, Norman CA. Numerical modeling of the ISM in the galactic center and disks. Mapping the Galaxy and Nearby Galaxies, Astrophysics and Space Science Proceedings ISBN 978-0-387-72767-7 Springer Science+Business Media, LLC, 2008, p 79. 2008;4:79. https://ui.adsabs.harvard.edu/#abs/2008ASSP....4...79W. doi: 10.1007/978-0-387-72768-4_11. Miller NA, Fomalont E, Kellermann K, et al. The VLA 1.4GHz survey of the extended chandra deep field south: First data release. American Astronomical Society, AAS Meeting #211, id 142 04. 2007:142.04. https://ui.adsabs.harvard.edu/#abs/2007AAS...21114204M. Wang JX, Zheng ZY, Malhotra S, et al. Chandra X-ray sources in the LALA cetus field. The Astrophysical Journal, Volume 669, Issue 2, pp 765-775. 2007;669:765-775. https://ui.adsabs.harvard.edu/#abs/2007ApJ...669..765W. doi: 10.1086/521809. Langer N, Norman CA, de Koter A, Vink JS, Cantiello M, Yoon S-. Pair creation supernovae at low and high redshift. Astronomy and Astrophysics, Volume 475, Issue 2, 2007, pp L19-L23. 2007;475:L23. https://ui.adsabs.harvard.edu/#abs/2007A&A...475L..19L. doi: 20078482. Achterberg A, Wiersma J, Norman CA. The weibel instability in relativistic plasmas. II. nonlinear theory and stabilization mechanism. Astronomy and Astrophysics, Volume 475, Issue 1, November III 2007, pp 19-36. 2007;475:19-36. https://ui.adsabs.harvard.edu/#abs/2007A&A...475...19A. doi: 20065366. Ptak A, Mobasher B, Hornschemeier A, Bauer F, Norman C. X-ray luminosity functions of normal galaxies in the great observatories origins deep survey. The Astrophysical Journal, Volume 667, Issue 2, pp 826-858. 2007;667:826-858. https://ui.adsabs.harvard.edu/#abs/2007ApJ...667..826P. doi: 10.1086/520824. Scoville N, Abraham RG, Aussel H, et al. COSMOS: Hubble space telescope observations. The Astrophysical Journal Supplement Series, Volume 172, Issue 1, pp 38-45. 2007;172:38-45. https://ui.adsabs.harvard.edu/#abs/2007ApJS..172...38S. doi: 10.1086/516580. Ptak A, Norman C, Hornschemeier A, Mobasher B, Bauer F. Bayesian MCMC fitting of normal galaxies in the GOODS. "X-ray Surveys, Evolution of Accretion, Star-Formation and the Large Scale Structure, held 2-6 July, 2007 in Rodos Island, Greece Edited by I Georgantopoulos and M Plionis Published online at http://wwwastro noa gr/xray07/, id 16". 2007:16. https://ui.adsabs.harvard.edu/#abs/2007xsea.confE..16P. Ptak A, Mobasher B, Hornschemeier A, Bauer F, Norman C. X-ray luminosity functions of normal galaxies in the GOODS. eprint arXiv:0706 1791. 2007:arXiv:0706.1791. https://ui.adsabs.harvard.edu/#abs/2007arXiv0706.1791P. Davis J, Norman C, Kobayashi T, Solaro R, Swartz D, Tikunova S. Effects of thin and thick filament proteins on calcium binding and exchange with cardiac troponin C. Biophysical Journal, vol 92, issue 9, pp 3195-3206. 2007;92:3195-3206. https://ui.adsabs.harvard.edu/#abs/2007BpJ....92.3195D. doi: 10.1529/biophysj.106.095406. Wada K, Norman CA. Density structure of the interstellar medium and the star formation rate in galactic disks. The Astrophysical Journal, Volume 660, Issue 1, pp 276-287. 2007;660:276-287. https://ui.adsabs.harvard.edu/#abs/2007ApJ...660..276W. doi: 10.1086/513002. Wang JX, Jiang P, Zheng ZY, et al. Most hard-X-ray-selected quasars in the chandra deep fields are obscured. The Astrophysical Journal, Volume 657, Issue 1, pp 95-101. 2007;657:95-101. https://ui.adsabs.harvard.edu/#abs/2007ApJ...657...95W. doi: 10.1086/510766. Balestra I, Tozzi P, Ettori S, et al. Tracing the evolution in the iron content of the intra-cluster medium. Astronomy and Astrophysics, Volume 462, Issue 2, February I 2007, pp 429-442. 2007;462:429-442. https://ui.adsabs.harvard.edu/#abs/2007A&A...462..429B. doi: 20065568. Wada K, Saitoh TR, Daisaka H, Norman CA. Toward realistic galaxy formation by numerical simulations. EAS Publications Series, Volume 24, 2007, pp 45-50. 2007;24:45-50. https://ui.adsabs.harvard.edu/#abs/2007EAS....24...45W. doi: 2007056. Balestra I, Tozzi P, Ettori S, et al. Tracing the evolution in the iron content of the ICM. Heating versus Cooling in Galaxies and Clusters of Galaxies, Eso Astrophysics Symposia ISBN 978-3-540-73483-3 Springer-Verlag Berlin Heidelberg, 2007, p 297. 2007:297. https://ui.adsabs.harvard.edu/#abs/2007hvcg.conf..297B. doi: 10.1007/978-3-540-73484-0_53. Balestra I, Tozzi P, Ettori S, et al. Evolution in the iron abundance of the ICM. Progress of Theoretical Physics Supplement, No 169, pp 49-52. 2007;169:49-52. https://ui.adsabs.harvard.edu/#abs/2007PThPS.169...49B. doi: 10.1143/PTPS.169.49. Tozzi P, Gilli R, Mainieri V, et al. VizieR online data catalog: X-ray properties of AGN in CDFS (tozzi+, 2006). VizieR On-line Data Catalog: J/A+A/451/457 Originally published in: 2006A&A 451 457T. 2007:J/A+A/451/457. https://ui.adsabs.harvard.edu/#abs/2007yCat..34510457T. Yoon S-, Langer N, Norman C. Single star progenitors of long gamma-ray bursts. Il Nuovo Cimento B, vol 121, Issue 12, p 1631-1632. 2006;121:1631-1632. https://ui.adsabs.harvard.edu/#abs/2006NCimB.121.1631Y. doi: 10.1393/ncb/i2007-10344-4. Yoon S-, Langer N, Norman C. Single star progenitors of long gamma-ray bursts. I. model grids and redshift dependent GRB rate. Astronomy and Astrophysics, Volume 460, Issue 1, December II 2006, pp 199-208. 2006;460:199-208. https://ui.adsabs.harvard.edu/#abs/2006A&A...460..199Y. doi: 20065912. Tozzi P, Gilli R, Mainieri V, et al. X-ray spectral properties of active galactic nuclei in the chandra deep field south. Astronomy and Astrophysics, Volume 451, Issue 2, May IV 2006, pp 457-474. 2006;451:457-474. https://ui.adsabs.harvard.edu/#abs/2006A&A...451..457T. doi: 20042592. Langer N, Norman CA. On the collapsar model of long gamma-ray bursts:Constraints from cosmic metallicity evolution. The Astrophysical Journal, Volume 638, Issue 2, pp L63-L66. 2006;638:L66. https://ui.adsabs.harvard.edu/#abs/2006ApJ...638L..63L. doi: 10.1086/500363. Ptak A, Mobasher B, Hornschemeier A, Bauer F, Norman C. The X-ray luminosity functions of galaxies derived from the GOODS survey. American Astronomical Society Meeting 207, id 43 03. 2005:43.03. https://ui.adsabs.harvard.edu/#abs/2005AAS...207.4303P. Wang JX, Wang TG, Tozzi P, et al. Relativistic outflow in CXOCDFS J033260.0-274748. The Astrophysical Journal, Volume 631, Issue 1, pp L33-L36. 2005;631:L36. https://ui.adsabs.harvard.edu/#abs/2005ApJ...631L..33W. doi: 10.1086/496970. Mainieri V, Rosati P, Tozzi P, et al. The chandra deep field south/GOODS survey. optically faint X-ray sources. Astronomy and Astrophysics, Volume 437, Issue 3, July III 2005, pp 805-821. 2005;437:805-821. https://ui.adsabs.harvard.edu/#abs/2005A&A...437..805M. doi: 20041212. Rossa J, Dettmar R-, Walterbos RAM, Norman CA. HST/WFPC2 investigation of extra-planar diffuse ionized gas in NGC 891. Extra-Planar Gas, ASP Conference Proceedings, Vol 331 Edited by Robert Braun Proceedings of the meeting held at Dwingeloo, the Netherlands, 7-11 June, 2004 San Francisco: Astronomical Society of the Pacific, 2005, p 177. 2005;331:177. https://ui.adsabs.harvard.edu/#abs/2005ASPC..331..177R. Szokoly GP, Bergeron J, Hasinger G, et al. VizieR online data catalog: Chandra deep field-south: Optical spectroscopy (szokoly+, 2004). VizieR On-line Data Catalog: J/ApJS/155/271 Originally published in: 2004ApJS 155 271S. 2005:J/ApJS/155/271. https://ui.adsabs.harvard.edu/#abs/2005yCat..21550271S. Zheng W, Mikles VJ, Mainieri V, et al. VizieR online data catalog: Photometric redshifts of X-ray sources in CDF-S (zheng+, 2004). VizieR On-line Data Catalog: J/ApJS/155/73 Originally published in: 2004ApJS 155 73Z. 2005:J/ApJS/155/73. https://ui.adsabs.harvard.edu/#abs/2005yCat..21550073Z. Gilli R, Daddi E, Zamorani G, et al. The spatial clustering of X-ray selected AGN and galaxies in the chandra deep field south and north. Astronomy and Astrophysics, v 430, p 811-825 (2005). 2005;430:811-825. https://ui.adsabs.harvard.edu/#abs/2005A&A...430..811G. doi: 20041375. Wiklind T, Bergström S, Rydbeck G, et al. The CDF-S viewed with SIMBA. Multiwavelength mapping of galaxy formation and evolution, Proceedings of the ESO Workshop held at Venice, Italy, 13-16 October 2003 Edited by A Renzini and R Bender Series Editor: Bruno Leibundgut, ESO, Garching, Germany ESO astrophysics symposia Library of Congress Catalog Card No 2005925391 ISBN 10 3-540-25665-2; ISBN 13 978-540-25565-6; QB857 5 E96 E78 2003 Published by Springer, Berlin, 2005, p 106. 2005:106. https://ui.adsabs.harvard.edu/#abs/2005mmgf.conf..106W. doi: 10.1007/10995020_16. Tsuneta S, Miyazaki S, Nakaya H, et al. Very wide field imager(VWFI) for the hubble origins probe(HOP). American Astronomical Society Meeting 205, id 100 03. 2004:100.03. https://ui.adsabs.harvard.edu/#abs/2004AAS...20510003T. Ford H, Bianchi L, Heckman T, et al. The hubble origins probe (HOP): Mission overview. American Astronomical Society Meeting 205, id 100 01. 2004:100.01. https://ui.adsabs.harvard.edu/#abs/2004AAS...20510001F. Norman C, Bianchi L, Ford H, et al. Hubble origins probe(HOP): Science overview. American Astronomical Society Meeting 205, id 100 02. 2004:100.02. https://ui.adsabs.harvard.edu/#abs/2004AAS...20510002N. Hornschemeier AE, Ptak AF, Mobasher B, Norman C, Bauer FE, Team G. The X-ray luminosity function of star-forming galaxies in the GOODS. American Astronomical Society Meeting 205, id 62 07. 2004:62.07. https://ui.adsabs.harvard.edu/#abs/2004AAS...205.6207H. Szokoly GP, Bergeron J, Hasinger G, et al. The chandra deep field-south: Optical spectroscopy. I. The Astrophysical Journal Supplement Series, Volume 155, Issue 2, pp 271-349. 2004;155:271-349. https://ui.adsabs.harvard.edu/#abs/2004ApJS..155..271S. doi: 10.1086/424707. Zheng W, Mikles VJ, Mainieri V, et al. Photometric redshift of X-ray sources in the chandra deep field-south. The Astrophysical Journal Supplement Series, Volume 155, Issue 1, pp 73-87. 2004;155:73-87. https://ui.adsabs.harvard.edu/#abs/2004ApJS..155...73Z. doi: 10.1086/424385. Wang JX, Malhotra S, Rhoads JE, Norman CA. Identifying high-redshift active galactic nuclei using X-ray hardness. The Astrophysical Journal, Volume 612, Issue 2, pp L109-L112. 2004;612:L112. https://ui.adsabs.harvard.edu/#abs/2004ApJ...612L.109W. doi: 10.1086/424799. Ptak A, Hornschemeier A, Norman C, Mobasher B. The X-ray-derived cosmological star formation history and the galaxy X-ray luminosity functions in the chandra deep fields. American Astronomical Society, HEAD meeting #8, id 35 05. 2004;8:35.05. https://ui.adsabs.harvard.edu/#abs/2004HEAD....8.3505P. Rossa J, Dettmar R, Walterbos RAM, Norman CA. A hubble space telescope WFPC2 investigation of the disk-halo interface in NGC 891. The Astronomical Journal, Volume 128, Issue 2, pp 674-686. 2004;128:674-686. https://ui.adsabs.harvard.edu/#abs/2004AJ....128..674R. doi: 10.1086/422489. Norman C, Ptak A, Hornschemeier A, et al. The X-ray-derived cosmological star formation history and the galaxy X-ray luminosity functions in the chandra deep fields north and south. The Astrophysical Journal, Volume 607, Issue 2, pp 721-738. 2004;607:721-738. https://ui.adsabs.harvard.edu/#abs/2004ApJ...607..721N. doi: 10.1086/383487. Wang JX, Rhoads JE, Malhotra S, et al. X-ray nondetection of the lyα emitters at z~4.5. The Astrophysical Journal, Volume 608, Issue 1, pp L21-L24. 2004;608:L24. https://ui.adsabs.harvard.edu/#abs/2004ApJ...608L..21W. doi: 10.1086/422311. Wang JX, Rhoads JE, Malhotra S, Norman CA. Identifying high redshift AGNs from X-ray colors. American Astronomical Society Meeting 204, id 44 07. 2004:44.07. https://ui.adsabs.harvard.edu/#abs/2004AAS...204.4407W. Wang JX, Malhotra S, Rhoads JE, et al. Deep chandra image in the bootes field. American Astronomical Society Meeting 204, id 48 14. 2004:48.14. https://ui.adsabs.harvard.edu/#abs/2004AAS...204.4814W. Wada K, Meurer G, Norman CA. Gravity-driven turbulence in galactic disks. In: Vol 5. ; 2004:12. https://ui.adsabs.harvard.edu/#abs/2004naoj.book...12W. Wang JX, Malhotra S, Rhoads JE, et al. The 172 ks chandra exposure of the LALA bootes field: X-ray source catalog. The Astronomical Journal, Volume 127, Issue 1, pp 213-229. 2004;127:213-229. https://ui.adsabs.harvard.edu/#abs/2004AJ....127..213W. doi: 10.1086/379960. Rosati P, Tozzi P, Ettori S, et al. Chandra and XMM-newton observations of RDCS 1252.9-2927, A massive cluster at z=1.24. The Astronomical Journal, Volume 127, Issue 1, pp 230-238. 2004;127:230-238. https://ui.adsabs.harvard.edu/#abs/2004AJ....127..230R. doi: 10.1086/379857. Heyvaerts J, Norman C. Global asymptotic solutions for relativistic magnetohydrodynamic jets and winds. The Astrophysical Journal, Volume 596, Issue 2, pp 1240-1255. 2003;596:1240-1255. https://ui.adsabs.harvard.edu/#abs/2003ApJ...596.1240H. doi: 10.1086/378221. Heyvaerts J, Norman C. Global asymptotic solutions for nonrelativistic magnetohydrodynamic jets and winds. The Astrophysical Journal, Volume 596, Issue 2, pp 1270-1294. 2003;596:1270-1294. https://ui.adsabs.harvard.edu/#abs/2003ApJ...596.1270H. doi: 10.1086/378220. Grogin NA, Koekemoer AM, Schreier EJ, et al. Hubble space telescope imaging in the chandra deep field-south. III. quantitative morphology of the 1 million second chandra counterparts and comparison with the field population. The Astrophysical Journal, Volume 595, Issue 2, pp 685-697. 2003;595:685-697. https://ui.adsabs.harvard.edu/#abs/2003ApJ...595..685G. doi: 10.1086/377450. Heyvaerts J, Norman C. Kinetic energy flux versus poynting flux in magnetohydrodynamic winds and jets: The intermediate regime. The Astrophysical Journal, Volume 596, Issue 2, pp 1256-1269. 2003;596:1256-1269. https://ui.adsabs.harvard.edu/#abs/2003ApJ...596.1256H. doi: 10.1086/378222. Tozzi P, Rosati P, Ettori S, Borgani S, Mainieri V, Norman C. Iron abundance in the intracluster medium at high redshift. The Astrophysical Journal, Volume 593, Issue 2, pp 705-720. 2003;593:705-720. https://ui.adsabs.harvard.edu/#abs/2003ApJ...593..705T. doi: 10.1086/376731. Gilli R, Cimatti A, Daddi E, et al. Tracing the large-scale structure in the chandra deep field south. The Astrophysical Journal, Volume 592, Issue 2, pp 721-727. 2003;592:721-727. https://ui.adsabs.harvard.edu/#abs/2003ApJ...592..721G. doi: 10.1086/375777. Wang J, Yaqoob T, Szokoly G, et al. A puzzling X-ray source found in the chandra deep field-south. The Astrophysical Journal, Volume 590, Issue 2, pp L87-L90. 2003;590:L90. https://ui.adsabs.harvard.edu/#abs/2003ApJ...590L..87W. doi: 10.1086/376821. Wang J, Malhotra S, Rhoads J, Brown M, Heckman T, Norman C. On the nature of lyman-α emitters. THE EMERGENCE OF COSMIC STRUCTURE: Thirteenth Astrophysics Conference AIP Conference Proceedings, Volume 666, pp 265-268 (2003). 2003;666:265-268. https://ui.adsabs.harvard.edu/#abs/2003AIPC..666..265W. doi: 10.1063/1.1581803. Malhotra S, Wang JX, Rhoads JE, Heckman TM, Norman CA. No X-ray-bright type II quasars among the lyα emitters. The Astrophysical Journal, Volume 585, Issue 1, pp L25-L28. 2003;585:L28. https://ui.adsabs.harvard.edu/#abs/2003ApJ...585L..25M. doi: 10.1086/373917. Wada K, Norman CA. The starburst-AGN connection: 3-D structure of the massive gas disk around the nucleus. Astrophysical Supercomputing using Particle Simulations, IAU Symposium #208, held 10-13 July 2001 in Tokyo, Japan Edited by Junichiro Makino and Piet Hut, San Francisco: Astronomical Society of the Pacific, 2003 , p 463. 2003;208:463. https://ui.adsabs.harvard.edu/#abs/2003IAUS..208..463W. Wada K, Norman CA. The starburst-AGN connection: Starburst-induced obscuring torus. Active Galactic Nuclei: from Central Engine to Host Galaxy, meeting held in Meudon, France, July 23-27, 2002, Eds : S Collin, F Combes and I Shlosman ASP (Astronomical Society of the Pacific), Conference Series, Vol 290, p 261. 2003;290:261. https://ui.adsabs.harvard.edu/#abs/2003ASPC..290..261W. Heckman TM, Norman CA, Strickland DK, Sembach KR. On the physical origin of O VI absorption-line systems. The Astrophysical Journal, Volume 577, Issue 2, pp 691-700. 2002;577:691-700. https://ui.adsabs.harvard.edu/#abs/2002ApJ...577..691H. doi: 10.1086/342232. Wada K, Meurer G, Norman CA. Gravity-driven turbulence in galactic disks. The Astrophysical Journal, Volume 577, Issue 1, pp 197-205. 2002;577:197-205. https://ui.adsabs.harvard.edu/#abs/2002ApJ...577..197W. doi: 10.1086/342151. Norman C, Hasinger G, Giacconi R, et al. A classic type 2 QSO. The Astrophysical Journal, Volume 571, Issue 1, pp 218-225. 2002;571:218-225. https://ui.adsabs.harvard.edu/#abs/2002ApJ...571..218N. doi: 10.1086/339855. Giacconi R, Zirm A, Wang J, et al. VizieR online data catalog: Chandra deep field south. 1 ms catalog (giacconi+, 2002). VizieR On-line Data Catalog: J/ApJS/139/369 Originally published in: 2002ApJS 139 369G. 2002:J/ApJS/139/369. https://ui.adsabs.harvard.edu/#abs/2002yCat..21390369G. Giacconi R, Zirm A, Wang J, et al. Chandra deep field south: The 1 ms catalog. The Astrophysical Journal Supplement Series, Volume 139, Issue 2, pp 369-410. 2002;139:369-410. https://ui.adsabs.harvard.edu/#abs/2002ApJS..139..369G. doi: 10.1086/338927. Koekemoer AM, Grogin NA, Schreier EJ, et al. Hubble space telescope imaging in the chandra deep field-south. II. WFPC2 observations of an X-ray flux-limited sample from the 1 million second chandra catalog. The Astrophysical Journal, Volume 567, Issue 2, pp 657-671. 2002;567:657-671. https://ui.adsabs.harvard.edu/#abs/2002ApJ...567..657K. doi: 10.1086/338129. Holley-Bockelmann K, Mihos JC, Sigurdsson S, Hernquist L, Norman C. The evolution of cuspy triaxial galaxies harboring central black holes. The Astrophysical Journal, Volume 567, Issue 2, pp 817-827. 2002;567:817-827. https://ui.adsabs.harvard.edu/#abs/2002ApJ...567..817H. doi: 10.1086/338683. Wada K, Norman CA. Obscuring material around seyfert nuclei with starbursts. The Astrophysical Journal, Volume 566, Issue 1, pp L21-L24. 2002;566:L24. https://ui.adsabs.harvard.edu/#abs/2002ApJ...566L..21W. doi: 10.1086/339438. Rosati P, Tozzi P, Giacconi R, et al. The chandra deep field-south: The 1 million second exposure. The Astrophysical Journal, Volume 566, Issue 2, pp 667-674. 2002;566:667-674. https://ui.adsabs.harvard.edu/#abs/2002ApJ...566..667R. doi: 10.1086/338339. Gilli R, Giacconi R, Tozzi P, et al. Resolving the hard X-ray background in the chandra deep field south. Lighthouses of the Universe: The Most Luminous Celestial Objects and Their Use for Cosmology: Proceedings of the MPA/ESO/MPE/USM Joint Astronomy Conference Held in Garching, Germany, 6-10 August 2001, ESO ASTROPHYSICS SYMPOSIA ISBN 3-540-43769-X Edited by M Gilfanov, R Sunyaev, and E Churazov Springer-Verlag, 2002, p 573. 2002:573. https://ui.adsabs.harvard.edu/#abs/2002luml.conf..573G. doi: 10.1007/10856495_90. Maíz-Apellániz J, Walborn NR, MacKenty JW, Norman CA, Mas-Hesse J, Pérez E. UV objective-prism spectroscopy with HST-STIS. Galaxies: The Third Dimension, ASP Conference Proceedings, Vol 282 Edited by Margarita Rosado, Luc Binette, and Lorena Arias ISBN: 1-58381-125-7 San Francisco: Astronomical Society of the Pacific, 2002 , p 43. 2002;282:43. https://ui.adsabs.harvard.edu/#abs/2002ASPC..282...43M. Rosati P, Borgani S, Norman C. The evolution of X-ray clusters of galaxies. Annual Review of Astronomy and Astrophysics, Vol 40, p 539-577 (2002). 2002;40:539-577. https://ui.adsabs.harvard.edu/#abs/2002ARA&A..40..539R. doi: 10.1146/annurev.astro.40.120401.150547. Koekemoer AM, Schreier EJ, Grogin NA, et al. Modelling new populations of galaxies and AGN revealed by deep chandra and HST imaging. American Astronomical Society, 199th AAS Meeting, id 141 07. 2001:141.07. https://ui.adsabs.harvard.edu/#abs/2001AAS...19914107K. Giacconi R, Zirm A, Wang J, et al. Chandra deep field south: The 1Msec catalog. eprint arXiv:astro-ph/0112184. 2001:ph/0112184. https://ui.adsabs.harvard.edu/#abs/2001astro.ph.12184G. Tozzi P, Rosati P, Nonino M, et al. New results from the X-ray and optical survey of the chandra deep field-south: The 300 kilosecond exposure. II. The Astrophysical Journal, Volume 562, Issue 1, pp 42-51. 2001;562:42-51. https://ui.adsabs.harvard.edu/#abs/2001ApJ...562...42T. doi: 10.1086/322492. Borgani S, Rosati P, Tozzi P, et al. Measuring Ωmwith the ROSAT deep cluster survey. The Astrophysical Journal, Volume 561, Issue 1, pp 13-21. 2001;561:13-21. https://ui.adsabs.harvard.edu/#abs/2001ApJ...561...13B. doi: 10.1086/323214. Schreier EJ, Koekemoer AM, Grogin NA, et al. Hubble space telescope imaging in the chandra deep field-south. I. multiple active galactic nucleus populations. The Astrophysical Journal, Volume 560, Issue 1, pp 127-138. 2001;560:127-138. https://ui.adsabs.harvard.edu/#abs/2001ApJ...560..127S. doi: 10.1086/322354. Rosati P, Tozzi P, Giacconi R, et al. The chandra deep field south: The 1 million second. eprint arXiv:astro-ph/0110452. 2001:ph/0110452. https://ui.adsabs.harvard.edu/#abs/2001astro.ph.10452R. Heyvaerts J, Norman C. Asymptotic structure of MHD winds and jets. Astronomical and Astrophysical Transactions, vol 20, Issue 2, pp 295-302. 2001;20:295-302. https://ui.adsabs.harvard.edu/#abs/2001A&AT...20..295H. doi: 10.1080/10556790108229714. Koekemoer AM, Schreier EJ, Grogin NA, et al. HST imaging in the chandra deep field south: Multiple AGN populations. American Astronomical Society, 198th AAS Meeting, id 74 10. 2001:74.10. https://ui.adsabs.harvard.edu/#abs/2001AAS...198.7410K. Grogin NA, Schreier EJ, Koekemoer AM, et al. First results from HST imaging of the chandra deep field south. American Astronomical Society, 198th AAS Meeting, id 79 06. 2001:79.06. https://ui.adsabs.harvard.edu/#abs/2001AAS...198.7906G. Schreier EJ, Koekemoer AM, Grogin NA, et al. HST imaging in the chandra deep field south: I. multiple AGN populations. eprint arXiv:astro-ph/0105271. 2001:ph/0105271. https://ui.adsabs.harvard.edu/#abs/2001astro.ph..5271S. Giacconi R, Rosati P, Tozzi P, et al. First results from the X-ray and optical survey of the chandra deep field south. The Astrophysical Journal, Volume 551, Issue 2, pp 624-634. 2001;551:624-634. https://ui.adsabs.harvard.edu/#abs/2001ApJ...551..624G. doi: 10.1086/320222. Norman C. Outflows associated with accretion. In X-ray Emission from Accretion onto Black Holes, Proceedings of a joint workshop held by the Center for Astrophysics (Johns Hopkins University) and the Laboratory for High Energy Astrophysics (NASA/ Goddard Space Flight Center) in Baltimore, MD, June 20-23, 2001, Eds : T Yaqoob and J H Krolik, to be published electronically, id #53. 2001. https://ui.adsabs.harvard.edu/#abs/2001xeab.confE..53N. Maíz-Apellániz J, MacKenty JW, Norman CA, Walborn NR. The spectacular warm ISM of NGC 4214. Tetons 4: Galactic Structure, Stars and the Interstellar Medium, ASP Conference Series, Vol 231 Edited by Charles E Woodward, Michael D Bicay, and J Michael Shull San Francisco: Astronomical Society of the Pacific ISBN: 1-58381-064-1, p 362. 2001;231:362. https://ui.adsabs.harvard.edu/#abs/2001ASPC..231..362M. Rossa J, Dettmar R, Walterbos RAM, Norman CA. HST observations of the disk-halo interface in the edge-on galaxy NGC 891. Tetons 4: Galactic Structure, Stars and the Interstellar Medium, ASP Conference Series, Vol 231 Edited by Charles E Woodward, Michael D Bicay, and J Michael Shull San Francisco: Astronomical Society of the Pacific ISBN: 1-58381-064-1, p 376. 2001;231:376. https://ui.adsabs.harvard.edu/#abs/2001ASPC..231..376R. Giacconi R, Rosati P, Tozzi P, et al. The chandra deep field south: Preliminary X-ray and optical results. Deep Fields: Proceedings of the ESO Workshop Held at Garching, Germany, 9-12 October 2000, ESO ASTROPHYSICS SYMPOSIA ISBN 3-540-42799-6 Edited by S Cristiani, A Renzini, and R E Williams Springer-Verlag, 2001, p 345. 2001:345. https://ui.adsabs.harvard.edu/#abs/2001defi.conf..345G. doi: 10.1007/10854354_99. Schreier EJ, Koekemoer A, Grogin N, et al. First HST observations of the chandra deep field south: Resolving AGN host galaxies. X-ray Astronomy 2000, ASP Conference Proceeding Vol 234 Edited by Riccardo Giacconi, Salvatore Serio, and Luigi Stella San Francisco: Astronomical Society of the Pacific ISBN: 1-58381-071-4, 2001 , p 553. 2001;234:553. https://ui.adsabs.harvard.edu/#abs/2001ASPC..234..553S. Tozzi P, Bergeron J, Borgani S, et al. Resolving the X-ray background with chandra: The 1 MS observation of the chandra deep field south *. Clusters of galaxies and the high redshift universe observed in X-rays, Recent results of XMM-Newton and Chandra, XXXVIth Rencontres de Moriond , XXIst Moriond Astrophysics Meeting, March 10-17, 2001 Savoie, France Edited by D M Neumann & J T T Van http://moriond.in2p3.fr/, id #66. 2001. https://ui.adsabs.harvard.edu/#abs/2001cghr.confE..66T. Giacconi R, Rosati P, Tozzi P, et al. The chandra deep field south: Preliminary X-ray and optical results. X-ray Astronomy 2000, ASP Conference Proceeding Vol 234 Edited by Riccardo Giacconi, Salvatore Serio, and Luigi Stella San Francisco: Astronomical Society of the Pacific ISBN: 1-58381-071-4, 2001 , p 525. 2001;234:525. https://ui.adsabs.harvard.edu/#abs/2001ASPC..234..525G. Wada K, Norman CA. Numerical models of the multiphase interstellar matter with stellar energy feedback on a galactic scale. The Astrophysical Journal, Volume 547, Issue 1, pp 172-186. 2001;547:172-186. https://ui.adsabs.harvard.edu/#abs/2001ApJ...547..172W. doi: 10.1086/318344. Giacconi R, Bergeron J, Borgani S, et al. A deep X-ray and optical survey of the chandra deep field south. Memorie della Societa Astronomica Italiana, Vol 72, p 831-840 (2001). 2001;72:831-840. https://ui.adsabs.harvard.edu/#abs/2001MmSAI..72..831G. Tozzi P, Norman C. The evolution of X-ray clusters and the entropy of the intracluster medium. The Astrophysical Journal, Volume 546, Issue 1, pp 63-84. 2001;546:63-84. https://ui.adsabs.harvard.edu/#abs/2001ApJ...546...63T. doi: 10.1086/318237. MacKenty JW, Maíz-Apellániz J, Pickens CE, Norman CA, Walborn NR. Hubble space telescope/WFPC2 and VLA observations of the ionized gas in the dwarf starburst galaxy NGC 4214. The Astronomical Journal, Volume 120, Issue 6, pp 3007-3026. 2000;120:3007-3026. https://ui.adsabs.harvard.edu/#abs/2000AJ....120.3007M. doi: 10.1086/316841. Giacconi R, Rosati P, Tozzi P, et al. The chandra deep field south. American Astronomical Society, 197th AAS Meeting, id 90 01. 2000:90.01. https://ui.adsabs.harvard.edu/#abs/2000AAS...197.9001G. Tozzi P, Giacconi R, Rosati P, et al. The chandra deep field south: Galaxies and clusters. American Astronomical Society, HEAD Meeting #5, id 14 04. 2000;5:14.04. https://ui.adsabs.harvard.edu/#abs/2000HEAD....5.1404T. Giacconi R, Rosati P, Tozzi P, et al. Recent results on the X-ray survey of the chandra deep field south. American Astronomical Society, HEAD Meeting #5, id 07 01. 2000;5:07.01. https://ui.adsabs.harvard.edu/#abs/2000HEAD....5.0701G. Tozzi P, Scharf C, Norman C. Detection of the entropy of the intergalactic medium: Accretion shocks in clusters, adiabatic cores in groups. The Astrophysical Journal, Volume 542, Issue 1, pp 106-119. 2000;542:106-119. https://ui.adsabs.harvard.edu/#abs/2000ApJ...542..106T. doi: 10.1086/309500. Rosati P, Giacconi R, Bergeron J, et al. Preliminary results on the X-ray background from the chandra deep field south. American Astronomical Society, 196th AAS Meeting, id 34 17. 2000:34.17. https://ui.adsabs.harvard.edu/#abs/2000AAS...196.3417R. Rosati P, Lidman C, Della Ceca R, et al. The ROSAT deep cluster survey: Probing the galaxy cluster population out to z = 1.3. The Messenger, vol 99, p 26-30. 2000;99:26-30. https://ui.adsabs.harvard.edu/#abs/2000Msngr..99...26R. Borgani S, Rosati P, della Ceca R, Tozzi P, Norman C. The ROSAT deep cluster survey: Constraints on cosmology. Large Scale Structure in the X-ray Universe, Proceedings of the 20-22 September 1999 Workshop, Santorini, Greece, eds Plionis, M & Georgantopoulos, I , Atlantisciences, Paris, France, p 167. 2000:167. https://ui.adsabs.harvard.edu/#abs/2000lssx.proc..167B. Tozzi P, Norman C. The virtues of X-ray clusters & the entropy of cosmic baryons. Large Scale Structure in the X-ray Universe, Proceedings of the 20-22 September 1999 Workshop, Santorini, Greece, eds Plionis, M & Georgantopoulos, I , Atlantisciences, Paris, France, p 89. 2000:89. https://ui.adsabs.harvard.edu/#abs/2000lssx.proc...89T. Papovich C, Norman CA, Bowen DV, et al. Hubble space telescope observations of the associated absorption-line systems in Q0122+0338. The Astrophysical Journal, Volume 531, Issue 2, pp 654-664. 2000;531:654-664. https://ui.adsabs.harvard.edu/#abs/2000ApJ...531..654P. doi: 10.1086/308478. Tozzi P, Norman C. The connection between X-ray clusters and star formation. From Extrasolar Planets to Cosmology: The VLT Opening Symposium: Proceedings of the ESO Symposium Held at Antofagasta, Chile, 1-4 March 1999, ESO ASTROPHYSICS SYMPOSIA ISBN 3-540-67163-3 Edited by J Bergeron and A Renzini Springer-Verlag, 2000, p 180. 2000:180. https://ui.adsabs.harvard.edu/#abs/2000fepc.conf..180T. doi: 10.1007/10720961_23. Psaltis D, Norman C. On the origin of quasi-periodic oscillations and broad-band noise in accreting neutron stars and black holes. eprint arXiv:astro-ph/0001391. 2000:ph/0001391. https://ui.adsabs.harvard.edu/#abs/2000astro.ph..1391P. Wada K, Spaans M, Kim S, Norman CA. Global star formation in the multi-phase ISM. Star Formation 1999, Proceedings of Star Formation 1999, held in Nagoya, Japan, June 21 - 25, 1999, Editor: T Nakamoto, Nobeyama Radio Observatory, p 36-37. 1999:36-37. https://ui.adsabs.harvard.edu/#abs/1999sf99.proc...36W. Lery T, Heyvaerts J, Appl S, Norman CA. Outflows from magnetic rotators. II. asymptotic structure and collimation. Astronomy and Astrophysics, v 347, p 1055-1068 (1999). 1999;347:1055-1068. https://ui.adsabs.harvard.edu/#abs/1999A&A...347.1055L. Achterberg A, Gallant YA, Norman CA, Melrose DB. Intergalactic propagation of UHE cosmic rays. eprint arXiv:astro-ph/9907060. 1999:ph/9907060. https://ui.adsabs.harvard.edu/#abs/1999astro.ph..7060A. Borgani S, Rosati P, Tozzi P, Norman C. Evolution of the cluster abundance from the ROSAT deep cluster survey. Observational Cosmology: The Development of Galaxy Systems, Proceedings of the International Workshop held at Sesto Pusteria, Bolzano, Italy, 30 June - 3 July, 1998, Eds : G Giuricin, M Mezzetti, and P Salucci, Astronomical Society of the Pacific, Vol 176, p 40. 1999;176:40. https://ui.adsabs.harvard.edu/#abs/1999ASPC..176...40B. Norman C. Black holes and the structure and evolution of galaxies. Presented at the KITP Program: Black Hole Astrophysics, Jun 10, 1999, Kavli Institute for Theoretical Physics, University of California, Santa Barbara, id 38. 1999:38. https://ui.adsabs.harvard.edu/#abs/1999bha..progE..38N. Wada K, Norman CA. The global structure and evolution of a self-gravitating multiphase interstellar medium in a galactic disk. The Astrophysical Journal, Volume 516, Issue 1, pp L13-L16. 1999;516:L16. https://ui.adsabs.harvard.edu/#abs/1999ApJ...516L..13W. doi: 10.1086/311987. Borgani S, Rosati P, Tozzi P, Norman C. Cosmological constraints from the ROSAT deep cluster survey. The Astrophysical Journal, Volume 517, Issue 1, pp 40-53. 1999;517:40-53. https://ui.adsabs.harvard.edu/#abs/1999ApJ...517...40B. doi: 10.1086/307158. Wada K, Norman CA. Global evolution of a self-gravitating multi-phase ISM in the central kpc region of galaxies. The formation of galactic bulges / edited by C M Carollo, H C Ferguson, R F G Wyse Cambridge, U K ; New York : Cambridge University Press, 1999 (Cambridge contemporary astrophysics), p 152. 1999:152. https://ui.adsabs.harvard.edu/#abs/1999fgb..conf..152W. Giacconi R, Rosati P, Norman C, et al. The AXAF deep field. Highlights in x-ray astronomy : international symposium in honour of Joachim Trümper's 65th birthday, June 17-19, 1998, Garching, Germany : symposium proceedings / edited by Bernd Aschenbach &Michael J Freyberg Garching : Max-Planck-Institut für extraterrestrische Physik, 1999 (MPE report, No 272, ISSN 0178-0719), p 419. 1999;272:419. https://ui.adsabs.harvard.edu/#abs/1999hxra.conf..419G. Hasan H, Pfenniger D, Norman CA. Constraints on secular building of galactic bulges. American Astronomical Society, 193rd AAS Meeting, id 105 09. 1998:105.09. https://ui.adsabs.harvard.edu/#abs/1998AAS...19310509H. Achterberg A, Gallant YA, Norman CA, Melrose DB. The intergalactic propagation of UHE cosmic rays. Abstracts of the 19th Texas Symposium on Relativistic Astrophysics and Cosmology, held in Paris, France, Dec 14-18, 1998 Eds : J Paul, T Montmerle, and E Aubourg (CEA Saclay), meeting abstract id 617. 1998:617. https://ui.adsabs.harvard.edu/#abs/1998tx19.confE.617A. Lery T, Heyvaerts J, Appl S, Norman CA. Outflows from magnetic rotators. I. inner structure. Astronomy and Astrophysics, v 337, p 603-624 (1998). 1998;337:603-624. https://ui.adsabs.harvard.edu/#abs/1998A&A...337..603L. Papovich CJ, Norman CA, Heckman T, Bowen DV, Blades JC, Danly L. The associated absorption line systems in Q 0122+0338. American Astronomical Society, 192nd AAS Meeting, id 11 03. 1998:11.03. https://ui.adsabs.harvard.edu/#abs/1998AAS...192.1103P. Pickens CE, MacKenty JW, Norman CA, Burg R, Wyse RFG, Griffiths RE. WFPC2 observations of the blue irregular galaxy NGC 4214. American Astronomical Society, 192nd AAS Meeting, id 66 03. 1998:66.03. https://ui.adsabs.harvard.edu/#abs/1998AAS...192.6603P. Sigurdsson S, Mihos C, Hernquist L, Norman C. Triaxial halos and cusps. Galactic Halos: A UC Santa Cruz Workshop, proceedings of a Conference held on the campus of UC Santa Cruz 11-15 August 1997 Edited by Dennis Zaritsky, ASP Conference Series #136, p 388. 1998;136:388. https://ui.adsabs.harvard.edu/#abs/1998ASPC..136..388S. Rosati P, Della Ceca R, Norman C, Giacconi R. The ROSAT deep cluster survey: The X-ray luminosity function out to z = 0.8. The Astrophysical Journal, Volume 492, Issue 1, pp L21-L24. 1998;492:L24. https://ui.adsabs.harvard.edu/#abs/1998ApJ...492L..21R. doi: 10.1086/311085. Sigurdsson S, Mihos C, Hernquist L, Norman C. Models of cuspy triaxial galaxies. American Astronomical Society, 191st AAS Meeting, id 49 12. 1997:49.12. https://ui.adsabs.harvard.edu/#abs/1997AAS...191.4912S. Spaans M, Norman CA. Hydrogen recombination line masers at the epochs of recombination and reionization. The Astrophysical Journal, Volume 488, Issue 1, pp 27-34. 1997;488:27-34. https://ui.adsabs.harvard.edu/#abs/1997ApJ...488...27S. doi: 10.1086/304693. Lery T, Appl S, Heyvaerts J, Norman CA. Instabilities in magnetized jets: An origin for knots? American Astronomical Society, 190th AAS Meeting, late abstracts, id 55 06. 1997:55.06. https://ui.adsabs.harvard.edu/#abs/1997AAS...190.5506L. Spaans M, Norman CA. Cosmological evolution of dwarf galaxies: The influence of star formation and the multiphase interstellar medium. The Astrophysical Journal, Volume 483, Issue 1, pp 87-97. 1997;483:87-97. https://ui.adsabs.harvard.edu/#abs/1997ApJ...483...87S. doi: 10.1086/304231. Lery T, Heyvaerts J, Appl S, Norman CA. Instabilities in MHD jets. American Astronomical Society, 190th AAS Meeting, id 41 17. 1997:41.17. https://ui.adsabs.harvard.edu/#abs/1997AAS...190.4117L. Norman CA, Spaans M. Molecules at high redshift: The evolution of the cool phase of protogalactic disks. The Astrophysical Journal, Volume 480, Issue 1, pp 145-154. 1997;480:145-154. https://ui.adsabs.harvard.edu/#abs/1997ApJ...480..145N. doi: 10.1086/303940. Norman C, Arav N. Conference summary. Mass Ejection from Active Galactic Nuclei; ASP Conference Series; Vol 128; 1997; ed N Aravm ; I Shlosman ; and R J Weymann (1997), p 291. 1997;128:291. https://ui.adsabs.harvard.edu/#abs/1997ASPC..128..291N. Lery T, Heyvaerts J, Appl S, Norman CA. Outflows of magnetized rotators: Structure and collimation. Low Mass Star Formation - from Infall to Outflow, Poster proceedings of IAU Symposium No 182 on Herbig-Haro Objects and the Birth of Low Mass Stars 20-24 January 1997, Chamonix, France, Edited by F Malbet and A Castets, p 152. 1997;182:152. https://ui.adsabs.harvard.edu/#abs/1997IAUS..182P.152L. Bowen DV, Norman CA, Heckman T, Blades JC, Danly L. A search for QSO absorption lines from nearby starburst galaxies. The Hubble Space Telescope and the High Redshift Universe, Proceedings of the 37th Herstmonceux conference, held at Cambridge, UK, 1-5 July 1996 Edited by Nial R Tanvir, Alfonso Aragon-Salamanca, and Jasper V Wall Singapore: World Scientific, 1997 , p 325. 1997:325. https://ui.adsabs.harvard.edu/#abs/1997hsth.conf..325B. Habe A, Norman C. On the upper limit of surface brightness of starburst galaxies. Galaxy Scaling Relations: Origins, Evolution and Applications, proceedings from the ESO Workshop held November, 1996, edited by Luiz Nicolaci da Costa and Alvio Renzini (Springer-Verlag), p 347. 1997:347. https://ui.adsabs.harvard.edu/#abs/1997gsr..proc..347H. Heyvaerts J, Norman CA. Asymptotic structure of rotating MHD winds and its relation to wind boundary conditions. Herbig-Haro Flows and the Birth of Stars; IAU Symposium No 182, Edited by Bo Reipurth and Claude Bertout Kluwer Academic Publishers, 1997, p 275-290. 1997;182:275-290. https://ui.adsabs.harvard.edu/#abs/1997IAUS..182..275H. Feldmeier A, Norman C, Pauldrach A, Owocki S, Puls J, Kaper L. Can the line-driven instability form BAL QSO clouds? Mass Ejection from Active Galactic Nuclei; ASP Conference Series; Vol 128; 1997; ed N Aravm ; I Shlosman ; and R J Weymann (1997), p 258. 1997;128:258. https://ui.adsabs.harvard.edu/#abs/1997ASPC..128..258F. Norman CA, Bowen DV, Heckman T, Blades C, Danly L. Hubble space telescope observations of QSO absorption lines associated with starburst galaxy outflows. Astrophysical Journal v 472, p 73. 1996;472:73. https://ui.adsabs.harvard.edu/#abs/1996ApJ...472...73N. doi: 10.1086/178042. Norman CA, Adams FC, Cowley S, Sudan RN. The statistical mechanics of reconnecting flux loops and consequences for massive star formation. Astrophysical Journal v 469, p 719. 1996;469:719. https://ui.adsabs.harvard.edu/#abs/1996ApJ...469..719N. doi: 10.1086/177819. Arnone DD, Burroughes JH, Pepper M, et al. Far-infrared study of a quasi-one-dimensional electron gas formed on (100)GaAs facets with hole gas sidegates on a (311)A GaAs substrate. Applied Physics Letters, Volume 69, Issue 13, September 23, 1996, pp 1933-1935. 1996;69:1933-1935. https://ui.adsabs.harvard.edu/#abs/1996ApPhL..69.1933A. doi: 10.1063/1.117626. Norman C, Meiksin A. Two-phase cooling flows with magnetic reconnection. Astrophysical Journal v 468, p 97. 1996;468:97. https://ui.adsabs.harvard.edu/#abs/1996ApJ...468...97N. doi: 10.1086/177673. Norman CA, Ferrara A. The turbulent interstellar medium: Generalizing to a scale-dependent phase continuum. Astrophysical Journal v 467, p 280. 1996;467:280. https://ui.adsabs.harvard.edu/#abs/1996ApJ...467..280N. doi: 10.1086/177603. Norman CA, Sellwood JA, Hasan H. Bar dissolution and bulge formation: An example of secular dynamical evolution in galaxies. Astrophysical Journal v 462, p 114. 1996;462:114. https://ui.adsabs.harvard.edu/#abs/1996ApJ...462..114N. doi: 10.1086/177133. Matsumoto R, Uchida Y, Hirose S, et al. Radio jets and the formation of active galaxies: Accretion avalanches on the torus by the effect of a large-scale magnetic field. Astrophysical Journal v 461, p 115. 1996;461:115. https://ui.adsabs.harvard.edu/#abs/1996ApJ...461..115M. doi: 10.1086/177041. Nakano T, Hasegawa T, Norman C. Prediction of stellar mass in star formation: Theory and its application to the orion A cloud. In: Vol 465. ; 1996:192. https://ui.adsabs.harvard.edu/#abs/1996LNP...465..192N. 10.1007/BFb0102637. Nakano T, Hasegawa T, Norman C. Prediction of stellar mass in star formation: Theory and its application to the orion A cloud. In: Vol 465. ; 1996. https://ui.adsabs.harvard.edu/#abs/1996LNP...465E.529N. Norman CA. The highest energy cosmic rays (review). Extragalactic radio sources: proceedings of the 175th Symposium of the International Astronomical Union, held in Bologna, Italy, 10-14 October 1995 Edited by Ron D Ekers, C Fanti, and L Padrielli Published by Kluwer Academic Publishers, p 291. 1996;175:291. https://ui.adsabs.harvard.edu/#abs/1996IAUS..175..291N. Norman CA. Galaxy formation and related topics. The Interplay Between Massive Star Formation, the ISM and Galaxy Evolution Proceedings of the 11th IAP Astrophysics Meeting, Institut d'Astrophysique, Paris, July 3-8, 1995, Gif-sur-Yvette: Editions Frontieres Edited by Daniel Kunth, B Guiderdoni, M Heydari-Malayeri, and Trinh Xu Thuan, 1996 , p 355. 1996:355. https://ui.adsabs.harvard.edu/#abs/1996ibms.conf..355N. Heyvaerts J, Norman CA. Collimation of MHD outflows. NATO Advanced Study Institute on Solar and Astrophysical Magnetohydrodynamic Flows, p 459 - 474. 1996;481:459-474. https://ui.adsabs.harvard.edu/#abs/1996ASIC..481..459H. Norman CA, Braun R. Cold gas at high redshift. Cold Gas at High Redshift, Proceedings of a workshop celebrating the 25th anniversary of the Westerbork Synthesis Radio Telescope, held in Hoogeven, The Netherlands, August 28-30, 1995, Dordrecht: Kluwer Academic Publishers, c1996, edited by M N Bremer and N Malcolm Astrophysics and Space Science Library, Vol 206, p 3. 1996;206:3. https://ui.adsabs.harvard.edu/#abs/1996ASSL..206....3N. doi: 10.1007/978-94-009-1726-2_1. Norman CA, Hasan H, Sellwood JA. Bar dissolution and bulge formation. New light on galaxy evolution The IAU Symposium 171, held at Max Planck Haus in Heidelberg, Germany from 25th-30th June 1995 Edited by Ralf Bender and Roger L Davies Published by Kluwer Academic Publishers, p 427. 1996;171:427. https://ui.adsabs.harvard.edu/#abs/1996IAUS..171..427N. Norman CA, Melrose DB, Achterberg A. The origin of cosmic rays above 10 18.5 eV. Astrophysical Journal v 454, p 60. 1995;454:60. https://ui.adsabs.harvard.edu/#abs/1995ApJ...454...60N. doi: 10.1086/176465. Scoville N, Norman C. Stellar contrails in quasi-stellar objects: The origin of broad absorption lines. Astrophysical Journal v 451, p 510. 1995;451:510. https://ui.adsabs.harvard.edu/#abs/1995ApJ...451..510S. doi: 10.1086/176239. Nakano T, Hasegawa T, Norman C. The mass of a star formed in a cloud core: Theory and its application to the orion A cloud. Astrophysical Journal v 450, p 183. 1995;450:183. https://ui.adsabs.harvard.edu/#abs/1995ApJ...450..183N. doi: 10.1086/176130. Rosati P, Della Ceca R, Burg R, Norman C, Giacconi R. A first determination of the surface density of galaxy clusters at very low X-ray fluxes. Astrophysical Journal Letters v 445, p L11. 1995;445:L11. https://ui.adsabs.harvard.edu/#abs/1995ApJ...445L..11R. doi: 10.1086/187877. Nakano T, Hasegawa T, Norman C. The mass of the star formed in a cloud core. Astrophysics and Space Science, Volume 224, Issue 1-2, pp 523-524. 1995;224:523-524. https://ui.adsabs.harvard.edu/#abs/1995Ap&SS.224..523N. doi: 10.1007/BF00667936. Norman CA. The physics of the interstellar medium and intergalactic medium: Conference summary. The Physics of the Interstellar Medium and Intergalactic Medium A Meeting in Honor of Professor George B Field, EIPC, Marciana Marina, Isola d'Elba, Italy, June 20-24, 1994 ASP Conference Series, Volume 80 Editor(s), A Ferrara, C F McKee, C Heiles, P R Shapiro ; Publisher, Astronomical Society of the Pacific, San Francisco, California, 1995 LC # QB790 P597 1994 ISBN #: 0-937707-99-6 , p 582. 1995;80:582. https://ui.adsabs.harvard.edu/#abs/1995ASPC...80..582N. Nakano T, Hasegawa T, Norman C. Nobeyama radio observatory report, no. 382: The mass of a star formed in a cloud core: Theory and its application to the orion A cloud. . 1995;95:29100. https://ui.adsabs.harvard.edu/#abs/1995STIN...9529100N. Wang QD, Walterbos RAM, Steakly MF, Norman CA, Braun R. ROSAT detection of diffuse hot gas in the edge-on galaxy NGC 4631. Astrophysical Journal v 439, p 176. 1995;439:176. https://ui.adsabs.harvard.edu/#abs/1995ApJ...439..176W. doi: 10.1086/175162. Ford HC, Bely PY, Bally J, et al. POST: A polar stratospheric telescope. Proc SPIE Vol 2199, p 298-314, Advanced Technology Optical Telescopes V, Larry M Stepp; Ed. 1994;2199:298-314. https://ui.adsabs.harvard.edu/#abs/1994SPIE.2199..298F. doi: 10.1117/12.176198. Walterbos RAM, Steakley MF, Wang QD, Norman CA, Braun R. The soft X-ray halo of the spiral galaxy NGC4631. The Soft X-ray Cosmos, Proceedings of the ROSAT Science Symposium held College Park, MD, November 8-10, 1993 AIP Conference Proceedings #313, New York: American Institute of Physics (AIP), 1994, edited by Eric M Schlegel and Robert Petre , p 173. 1994;313:173. https://ui.adsabs.harvard.edu/#abs/1994AIPC..313..173W. doi: 10.1063/1.46707. Norman CA. From starburst galaxies to protogalaxies. "Galaxy formation, International School of Physics "Enrico Fermi", Proceedings of the International School of Physics "Enrico Fermi", course 122, Varenna on Lake Como, 21-31 July 1992, Amsterdam: North-Holland, |c1994, edited by Silk, Joseph; Vittorio, N, p 283". 1994:283. https://ui.adsabs.harvard.edu/#abs/1994gafo.conf..283N. Norman C. Quasar absorption line studies of starburst galaxy environments - cycle 4 carry-over. HST Proposal ID 5704 Cycle 4. 1994:5704. https://ui.adsabs.harvard.edu/#abs/1994hst..prop.5704N. Wang QD, Walterbos RAM, Steakley MF, Norman CA, Braun R. ROSAT detection of diffuse hot gas in the edge-on galaxy NGC 4631. . 1994;95:17496. https://ui.adsabs.harvard.edu/#abs/1994STIN...9517496W. Norman CA. The second hubble fellows symposium. proceedings. 2. hubble fellows symposium, baltimore, MD (USA), 9 - 11 nov 1992. Publications of the Astronomical Society of the Pacific, Vol 105, No 691, p 951 - 1078. 1993;105:951-1078. https://ui.adsabs.harvard.edu/#abs/1993PASP..105..951N. Hasan H, Pfenniger D, Norman C. Galactic bars with central mass concentrations: Three-dimensional dynamics. Astrophysical Journal v 409, p 91. 1993;409:91. https://ui.adsabs.harvard.edu/#abs/1993ApJ...409...91H. doi: 10.1086/172644. Hasan H, Sellwood JA, Norman CA. Investigating a self-consistent galactic potential with central mass concentration. Galactic bulges: proceedings of the 153rd Symposium of the International Astronomical Union held in Ghent, Belgium, August 17-22, 1992 Edited by Herwig DeJonghe and Harm Jan Habing International Astronomical Union Symposium no 153, Kluwer Academic Publishers, Dordrecht, p 385. 1993;153:385. https://ui.adsabs.harvard.edu/#abs/1993IAUS..153..385H. Walterbos R, Braun R, Norman C. The disk-halo interface in edge-on spirals. In NASA Ames Research Center, The Evolution of Galaxies and Their Environment p 326-327 (SEE N93-26706 10-90). 1993:326-327. https://ui.adsabs.harvard.edu/#abs/1993egte.conf..326W. Ball L, Melrose DB, Norman CA. On ``High flyers'' in fermi acceleration. Astrophysical Journal Letters v 398, p L65. 1992;398:L65. https://ui.adsabs.harvard.edu/#abs/1992ApJ...398L..65B. doi: 10.1086/186578. Ball L, Melrose D, Norman C. High-energy cosmic-ray origin. Nature, Volume 359, Issue 6390, pp 23 (1992). 1992;359:23. https://ui.adsabs.harvard.edu/#abs/1992Natur.359Q..23B. doi: 10.1038/359023a0. Norman C. Introduction. Publications of the Astronomical Society of the Pacific, v 104, p 768. 1992;104:768. https://ui.adsabs.harvard.edu/#abs/1992PASP..104..768N. doi: 10.1086/133050. Norman CA. Star formation at high redshift. Australian Journal of Physics (ISSN 0004-9506), vol 45, no 4, p 389-394. 1992;45:389-394. https://ui.adsabs.harvard.edu/#abs/1992AuJPh..45..389N. doi: 10.1071/PH920389. Norman CA. First results from the hubble space telescope (chairman and editor). Highlights of Astronomy, Vol 9, p 443. 1992;9:443. https://ui.adsabs.harvard.edu/#abs/1992HiA.....9..443N. Norman C. Quasar absorption line studies of starburst galaxy environments. HST Proposal ID 3676 Cycle 2. 1991:3676. https://ui.adsabs.harvard.edu/#abs/1991hst..prop.3676N. Ikeuchi S, Norman CA. What determines the physical quantities of galaxies? A two-component gas model for protogalaxies with energy input from supernovae. Astrophysical Journal v 375, p 479. 1991;375:479. https://ui.adsabs.harvard.edu/#abs/1991ApJ...375..479I. doi: 10.1086/170209. Kylafis ND, Norman CA. Collisional pumping of H 2O masers in star-forming regions. Astrophysical Journal v 373, p 525. 1991;373:525. https://ui.adsabs.harvard.edu/#abs/1991ApJ...373..525K. doi: 10.1086/170071. Norman C. Models of starburst galaxies. In: ; 1991:349. https://ui.adsabs.harvard.edu/#abs/1991mss..book..271N. Leitherer C, Walborn N, Heckman T, Norman C. Massive stars in starbursts. ; 1991:349. https://ui.adsabs.harvard.edu/#abs/1991mss..book.....L.
Norman CA. The global mass, energy, and photoionization balance of the disk-halo interaction. The Interstellar Disk-Halo Connection in Galaxies Proceedings of the 144th IAU Symposium Edited by Hans Bloemen Kluwer Academic Publishers (IAU Symposium, No 144), 1991 , p 337. 1991;144:337. https://ui.adsabs.harvard.edu/#abs/1991IAUS..144..337N. Hasan H, Pfenniger D, Norman C. The 3-DIMENSIONAL dynamics of barred galaxies with central mass concentrations. Dyamics of Disc Galaxies, Proceedings of the conference held 25-30 May 1991 at Varberg Castle, Sweden Edited by B Sundelius Göteborgs: Göteborgs University and Chalmers University of Technology, p 167, 1991. 1991:167. https://ui.adsabs.harvard.edu/#abs/1991dodg.conf..167H. Leitherer C, Walborn NR, Heckman TM, Norman CA. Massive stars in starbursts. proceedings. Space Telesc Sci Inst Symp Ser , Vol 5,. 1991;5. https://ui.adsabs.harvard.edu/#abs/1991STSIS...5.....L.
Pfenniger D, Norman CA. The growth of bulges and central mass concentrations by dissipative processes. Dynamics of Galaxies and Their Molecular Cloud Distributions: Proceedings of the 146th Symposium of the International Astronomical Union, held in Paris, France, June 4-9, 1990 Edited by F Combes and Fabienne Casoli International Astronomical Union Symposium no 146, Kluwer Academic Publishers, Dordrecht, 1991 , p 323. 1991;146:323. https://ui.adsabs.harvard.edu/#abs/1991IAUS..146..323P. Norman C. The environments of starburst galaxies: Absorption-line studies of galactic outflows. HST Proposal ID 2644 Cycle 1. 1990:2644. https://ui.adsabs.harvard.edu/#abs/1990hst..prop.2644N. Norman CA. Paired and interacting galaxies: Conference summary. In NASA, Marshall Space Flight Center, Paired and Interacting Galaxies: International Astronomical Union Colloquium No 124 p 765-770 (SEE N91-16858 08-90). 1990;3098:765-770. https://ui.adsabs.harvard.edu/#abs/1990NASCP3098..765N. Pfenniger D, Norman C. Dissipation in barred galaxies: The growth of bulges and central mass concentrations. Astrophysical Journal v 363, p 391. 1990;363:391. https://ui.adsabs.harvard.edu/#abs/1990ApJ...363..391P. doi: 10.1086/169352. Norman CA, Panagia N. The ionization structure of the halo due to OB associations in chimneys. Bulletin of the American Astronomical Society, Vol 22, p 1321. 1990;22:1321. https://ui.adsabs.harvard.edu/#abs/1990BAAS...22.1321N. Hasan H, Norman CA. Orbit characteristics around a central mass concentration in barred galaxies. Bulletin of the American Astronomical Society, Vol 22, p 1241. 1990;22:1241. https://ui.adsabs.harvard.edu/#abs/1990BAAS...22R1241H. Hasan H, Norman C. Chaotic orbits in barred galaxies with central mass concentrations. Astrophysical Journal v 361, p 69. 1990;361:69. https://ui.adsabs.harvard.edu/#abs/1990ApJ...361...69H. doi: 10.1086/169168. Norman CA. Quasars, active galaxies, and starbursts. Astrophysics from the Moon AIP Conference Proceedings, Volume 207, pp 241-246 (1990). 1990;207:241-246. https://ui.adsabs.harvard.edu/#abs/1990AIPC..207..241N. doi: 10.1063/1.39330. Hasan H, Norman C. Stellar orbits in barred galaxies with black hole or central mass concentration. Bulletin of the American Astronomical Society, Vol 22, p 863. 1990;22:863. https://ui.adsabs.harvard.edu/#abs/1990BAAS...22..863H. Kylafis ND, Norman CA. Collisional pumping of OH masers in the 2 pi 1/2 ladder. Astrophysical Journal v 350, p 209. 1990;350:209. https://ui.adsabs.harvard.edu/#abs/1990ApJ...350..209K. doi: 10.1086/168374. Norman CA. Quasar absorption lines and galaxy formation. "Confrontation between Theories and Observations in Cosmology: Present Status and Future Programmes International School of Physics "Enrico Fermi", Proceedings of the International School of Physics "Enrico Fermi", course 105, Varenna on Lake Como, July 21-31, 1987, Amsterdam: North-Holland, Edited by Jean Audouze, 1990 , p 273". 1990:273. https://ui.adsabs.harvard.edu/#abs/1990cbto.conf..273N. Batten AH, Blades JC, Turnshek D, Norman CA, Boisse P. Book review: Resolute and undertaking characters: The lives of wilhelm and otto struve. / reidel, 1988. Space science reviews, vol 53, no 1/2, p 167 (1990). 1990;53:167. https://ui.adsabs.harvard.edu/#abs/1990SSRv...53..167B. Norman CA. Some aspect of starburst galaxies. Windows on Galaxies, Proceedings on the 6th Workshop of the Advanced School of Astronomy of the Ettore Majorana Centre, Erice, May 21-23, 1989, Dordrecht: Kluwer, 1990, edited by Giuseppina Fabbiano, John S Gallagher, and Alvio Renzini Astrophysics and Space Science Library, Vol 160 , p 311. 1990;160:311. https://ui.adsabs.harvard.edu/#abs/1990ASSL..160..311N. doi: 10.1007/978-94-009-0543-6_41. Pfenniger D, Norman C. Slow dissipation in bars and the fuelling of nuclei. In: ; 1990:485-487. https://ui.adsabs.harvard.edu/#abs/1990dig..book..485P. Norman CA. The origin and evolution of cosmic magnetic fields. "Confrontation between Theories and Observations in Cosmology: Present Status and Future Programmes International School of Physics "Enrico Fermi", Proceedings of the International School of Physics "Enrico Fermi", course 105, Varenna on Lake Como, July 21-31, 1987, Amsterdam: North-Holland, Edited by Jean Audouze, 1990 , p 29". 1990:29. https://ui.adsabs.harvard.edu/#abs/1990cbto.conf...29N. Blades JC, Turnshek D, Norman CA, Boisse P. Book review: Quasar absorption lines. / CUP, 1988. Space science reviews, vol 53, no 1/2, p 168 (1990). 1990;53:168. https://ui.adsabs.harvard.edu/#abs/1990SSRv...53..168B. Norman CA, Heyvaerts J. The collimation of magnetohydrodynamic winds - bipolar flows and jets. Galactic and Intergalactic Magnetic Fields Proceedings of the 140th Symposium of the International Astronomical Union, held in Heidelberg, FRG, June 19-23, 1989 Editors, R Beck, P P Kronberg, R Wielebinski; Publisher, Kluwer Academic Publishers, Dordrecht, The Netherlands; Boston, 1990 ISBN # 0-7923-0704-6 LC # QB857 5 M34 I58 P 353, 1990. 1990;140:353. https://ui.adsabs.harvard.edu/#abs/1990IAUS..140..353N. Norman C, Hasan H. Chaotic orbits in barred structures with central mass concentration. In: ; 1990:479-482. https://ui.adsabs.harvard.edu/#abs/1990dig..book..479N. Norman CA. The hubble space telescope and other initiatives. (NASA, NSF, Texas Academy of Science, et al , Texas Symposium on Relativistic Astrophysics, 14th, Dallas, TX, Dec 11-16, 1988) New York Academy of Sciences, Annals (ISSN 0077-8923), vol 571, 1989, p 497-512. 1989;571:497-512. https://ui.adsabs.harvard.edu/#abs/1989NYASA.571..497N. doi: 10.1111/j.1749-6632.1989.tb50536.x. Heyvaerts J, Norman C. The collimation of magnetized winds. Astrophysical Journal v 347, p 1055. 1989;347:1055. https://ui.adsabs.harvard.edu/#abs/1989ApJ...347.1055H. doi: 10.1086/168195. Norman CA, Ikeuchi S. The disk-halo interaction: Superbubbles and the structure of the interstellar medium. Astrophysical Journal v 345, p 372. 1989;345:372. https://ui.adsabs.harvard.edu/#abs/1989ApJ...345..372N. doi: 10.1086/167912. Norman C, Pfenniger D. Chaotic gas flow in galactic nuclei. Bulletin of the American Astronomical Society, Vol 21, p 1174. 1989;21:1174. https://ui.adsabs.harvard.edu/#abs/1989BAAS...21.1174N. Hasan H, Norman CA. Stability of stellar orbits in barred galaxies with black hole. Bulletin of the American Astronomical Society, Vol 21, p 1158. 1989;21:1158. https://ui.adsabs.harvard.edu/#abs/1989BAAS...21.1158H. van Buren D, Norman CA. Infrared supernovae in starbursts. Astrophysical Journal Letters v 336, p L67. 1989;336:L67. https://ui.adsabs.harvard.edu/#abs/1989ApJ...336L..67V. doi: 10.1086/185363. Norman CA. Major issues in planetary system formation: Introduction. The Formation and Evolution of Planetary Systems Meeting, p 275 - 276. 1989:275-276. https://ui.adsabs.harvard.edu/#abs/1989feps.meet..275N. Norman CA, Paresce F. Circumstellar material around nearby stars: Clues to the formation of planetary systems. IN: The formation and evolution of planetary systems; Proceedings of the Meeting, Baltimore, MD, May 9-11, 1988 (A90-31251 12-90) Cambridge and New York, Cambridge University Press, 1989, p 151-169. 1989:151-169. https://ui.adsabs.harvard.edu/#abs/1989feps.meet..151N. Scoville N, Norman C. The evolution of starburst galaxies to active galactic nuclei. Active Galactic Nuclei: proceedings of the 134th Symposium of the International Astronomical Union, held in Santa Cruz, California, August 15-19, 1988 Edited by Donald E Osterbrock and Joseph S Miller International Astronomical Union Symposium no 134, Kluwer Academic Publishers, Dordrecht, p 65. 1989;134:65. https://ui.adsabs.harvard.edu/#abs/1989IAUS..134...65S. Scoville N, Norman C. Broad emission lines from the mass-loss envelopes of giant stars in active galactic nuclei. Astrophysical Journal v 332, p 163. 1988;332:163. https://ui.adsabs.harvard.edu/#abs/1988ApJ...332..163S. doi: 10.1086/166641. van Buren D, Norman CA. Infrared supernovae in starbursts. Bulletin of the American Astronomical Society, Vol 20, p 1050. 1988;20:1050. https://ui.adsabs.harvard.edu/#abs/1988BAAS...20.1050V. Norman C, Scoville N. The evolution of starburst galaxies to active galactic nuclei. Astrophysical Journal v 332, p 124. 1988;332:124. https://ui.adsabs.harvard.edu/#abs/1988ApJ...332..124N. doi: 10.1086/166637. Norman CA, Weaver HA. Body building in the solar nebula. Nature, Volume 334, Issue 6182, pp 474-475 (1988). 1988;334:474-475. https://ui.adsabs.harvard.edu/#abs/1988Natur.334..474N. doi: 10.1038/334474a0. Heyvaerts J, Norman C, Pudritz RE. A magnetic loop model for structure and activity in the galactic center. Astrophysical Journal v 330, p 718. 1988;330:718. https://ui.adsabs.harvard.edu/#abs/1988ApJ...330..718H. doi: 10.1086/166506. Ikeuchi S, Norman C, Zhan Y. A two-component dark matter universe. II. linear fluctuation theory. Astrophysical Journal v 324, p 35. 1988;324:35. https://ui.adsabs.harvard.edu/#abs/1988ApJ...324...35I. doi: 10.1086/165878. Norman CA. Starbursts: Nature and implications. Galactic and Extragalactic Star Formation, Proceeings of a NATO Advanced Study Institute, held in Whistler, Canada, June 21 - July 4, 1987, Dordrecht: Kluwer, 1988, edited by Ralph E Pudritz and Michel Fich NATO Advanced Science Institutes (ASI) Series C, Volume 232, p 495. 1988;232:495. https://ui.adsabs.harvard.edu/#abs/1988ASIC..232..495N. doi: 10.1007/978-94-009-2973-9_29. Norman CA. Starbursts: Nature and environment. In: Vol 297. ; 1988:177. https://ui.adsabs.harvard.edu/#abs/1988LNP...297..177N. 10.1007/BFb0118806. Blades JC, Turnshek DA, Norman CA. QSO absorption lines: Probing the universe. Space Telescope Science Institute Symposium Series, Proceedings of the QSO Absorption Line Meeting, Baltimore, May 19-21, 1987, Cambridge: University Press, 1988, edited by Blades, J Chris; Turnshek, David A ; Norman, Colin A. 1988. https://ui.adsabs.harvard.edu/#abs/1988qsal.proc.....B.
Blades JC, Turnshek DA, Norman CA. QSO absorption lines: Probing the universe. proceedings of the QSO absorption line meeting held may 19-21, 1987, in baltimore, MD USA. QSO Absorption Lines: Probing the Universe Proceedings of the QSO Absorption Line Meeting held May 19-21, 1987, in Baltimore, MD USA Edited by J Chris Blades, David A Turnshek, and Colin A Norman ISBN 0-521-34561 8 (hard cover); QB860 Q76 1987 523-dc 19 88-816 CIP Published for the Sapce Telescope Science Institute by Cambridge University Press, Cambridge, England, 1988. 1988. https://ui.adsabs.harvard.edu/#abs/1988qal..conf.....B.
Norman CA, Ikeuchi S. The disk-halo connection and the nature of the interstellar medium. In: Vol 306. ; 1988:155. https://ui.adsabs.harvard.edu/#abs/1988LNP...306..155N. 10.1007/3-540-19484-3_22. Kylafis ND, Norman C. On pumping the strong water maser sources. Astrophysical Journal v 323, p 346. 1987;323:346. https://ui.adsabs.harvard.edu/#abs/1987ApJ...323..346K. doi: 10.1086/165832. Norman C. Starbursts and their dynamics. . 1987;88:30549. https://ui.adsabs.harvard.edu/#abs/1987STIN...8830549N. Norman CA. Star formation and dynamics in starburst nuclei. Star formation in galaxies, Proceedings of a conference at the California Institute of Technology, Pasadena, California, June 16-19, 1986 Edited by Carol J Lonsdale Persson, p 395-400 (SEE N87-24266 17-89). 1987;2466:395-400. https://ui.adsabs.harvard.edu/#abs/1987NASCP2466..395N. Heyvaerts J, Pudritz RE, Norman CA. A magnetic loop model for activity in the galactic centre. AIP Conference Proceedings, Volume 155, pp 176-180 (1987). 1987;155:176-180. https://ui.adsabs.harvard.edu/#abs/1987AIPC..155..176H. doi: 10.1063/1.36423. Norman CA, Renzini A, Tosi M. Stellar populations. ; 1987:256. https://ui.adsabs.harvard.edu/#abs/1987stpo.book.....N.
Norman CA. Theory of bipolar flows and jets from young stars. Proceedings of the 122nd symposium of the IAU held in Heidelberg, F R G , june 23-27, 1986 Ed by I Appenzeller and C Jordan Circumstellar matter, 51-59 (1987). 1987;122:51-59. https://ui.adsabs.harvard.edu/#abs/1987IAUS..122...51N. Norman C. Poster discussion. Dark Matter in the Universe Proceedings of the 117th Symposium of the International Astronomical Union, held in Princeton, New Jersey, U S A , June 24-28, 1985 Editors, J Kormendy, G R Knapp; Publishers, D Reidel Publishing Company, Dordrecht, Holland Sold and distributed in the U S A and Canada by Kluwer Academic Publishers, Norwell, Massachusetts, 1987 ISBN # 90-277-2356-7 LC # QB790 I573 1985, P 525, 1987. 1987;117:525. https://ui.adsabs.harvard.edu/#abs/1987IAUS..117..525N. Norman CA. Cosmology; scientific overview. Instrumentation for cosmology, p 1 - 4. 1987:1-4. https://ui.adsabs.harvard.edu/#abs/1987inco.conf....1N. Norman CA. Structure of galaxies and star formation workshop summary. IN: European Regional Astronomy Meeting of the IAU, 10th, Prague, Czechoslovakia, Aug 24-29, 1987, Proceedings Volume 4 (A89-32590 13-90) Ondrejov, Czechoslovakia, Czechoslovak Academy of Sciences, 1987, p 345-347; Discussion, p 347, 348. 1987;4:345-347. https://ui.adsabs.harvard.edu/#abs/1987PAICz..69..345N. Norman CA. The theory of bipolar flows. IN: European Regional Astronomy Meeting of the IAU, 10th, Prague, Czechoslovakia, Aug 24-29, 1987, Proceedings Volume 4 (A89-32590 13-90) Ondrejov, Czechoslovakia, Czechoslovak Academy of Sciences, 1987, p 21-24; Discussion, p 23. 1987;4:21-24. https://ui.adsabs.harvard.edu/#abs/1987PAICz..69...21N. Renzini A, Norman CA, Tosi M. Stellar populations. ; 1987. https://ui.adsabs.harvard.edu/#abs/1987stpo.book.....R.
Norman CA. Current problems in astrophysics needing space-based radio astronomy. IN: Radio astronomy from space; Proceedings of the Workshop, Green Bank, WV, Sept 30-Oct 2, 1986 (A88-38077 15-89) Charlottesville, VA, National Radio Astronomy Observatory, 1987, p 15-19. 1987:15-19. https://ui.adsabs.harvard.edu/#abs/1987raas.work...15N. Ikeuchi S, Norman CA. The formation and evolution of dwarf galaxies and lyman-alpha clouds: Two-component dark matter. Astrophysical Journal v 312, p 485. 1987;312:485. https://ui.adsabs.harvard.edu/#abs/1987ApJ...312..485I. doi: 10.1086/164894. Norman CA. Starbursts and their dynamics. IN: Starbursts and galaxy evolution; Proceedings of the Twenty-second Moriond Astrophysics Meeting, Les Arcs, France, Mar 8-15, 1987 (A89-10001 01-90) Gif-sur-Yvette, France, Editions Frontieres, 1987, p 483-493. 1987:483-493. https://ui.adsabs.harvard.edu/#abs/1987sbge.proc..483N. Norman CA. Structure of molecular clouds and space-based submillimetre telescopes for example first. Space-borne Sub-Millimeter Astronomy Mission, Proceedings of an ESA Workshop held in Segovia, Spain, 4-7 Jun 1986 Edited by Norman Longdon Paris, France: European Space Agency, ESA SP-260, 1986 , p 295. 1986;260:295. https://ui.adsabs.harvard.edu/#abs/1986ESASP.260..295N. Pudritz RE, Norman CA. Hydromagnetic winds from accretion disks. Conference on Jets from Stars and Galaxies, Toronto, Canada, June 24-27, 1985 Canadian Journal of Physics (ISSN 0008-4204), vol 64, April 1986, p 501-506 Research supported by Johns Hopkins University and Space Telescope Science Institute. 1986;64:501-506. https://ui.adsabs.harvard.edu/#abs/1986CaJPh..64..501P. doi: 10.1139/p86-094. Pudritz RE, Norman CA. Bipolar hydromagnetic winds from disks around protostellar objects. Astrophysical Journal v 301, p 571. 1986;301:571. https://ui.adsabs.harvard.edu/#abs/1986ApJ...301..571P. doi: 10.1086/163924. Norman CA. On the structure and evolution of dwarf galaxies. Star-forming dwarf galaxies and related objects, p 477 - 486. 1986:477-486. https://ui.adsabs.harvard.edu/#abs/1986sfdg.conf..477N. Carlberg RG, Lake G, Norman CA. Formation of elliptical galaxies and massive halos. Astrophysical Journal Letters v 300, p L1. 1986;300:L1. https://ui.adsabs.harvard.edu/#abs/1986ApJ...300L...1C. doi: 10.1086/184591. Kylafis N, Norman C. On pumping astronomical masers. Masers, Molecules and Mass Outflows in Star Forming Regions Proceedings of a meeting held by the Haystack Observatory, Westford, Mass , USA, 15 - 16 May 1985 A D Haschick (Editor) Haystack Observatory, Westford, Mass , USA P 341-350, 1986. 1986:341-350. https://ui.adsabs.harvard.edu/#abs/1986mmmo.conf..341K. Norman CA, Renzini A, Tosi M, Searle L, Lequeux J. Stellar populations. proceedings of a meeting, held at baltimore, MD,USA, 20 - 22 may 1986. ; 1986. https://ui.adsabs.harvard.edu/#abs/1986sppm.book.....N.
Griffiths RE, Butcher HR, Danielson GE, et al. An advanced radial camera for the hubble space telescope. IN: Solid state imagers and their applications; Proceedings of the Meeting, Cannes, France, November 26, 27, 1985 (A87-19702 07-33) Bellingham, WA, Society of Photo-Optical Instrumentation Engineers, 1986, p 159-177. 1986;591:159-177. https://ui.adsabs.harvard.edu/#abs/1986SPIE..591..159G. doi: 10.1117/12.952091. Griffiths RE, Butcher HR, Danielson GE, et al. An advanced radial camera for the hubble space telescope. Proc SPIE Int Soc Opt Eng , Vol 627, Part 2, p 591 - 609. 1986;627:591-609. https://ui.adsabs.harvard.edu/#abs/1986SPIE..627..591G. doi: 10.1117/12.968136. Norman CA, Renzini A, Tosi M. Stellar populations / baltimore,MD. / 1986May, 1986. Stellar Populations Proceedings of the Stellar Populations Meeting, May 20-22, 1986, in Baltimore, Maryland Editors, Colin A Norman, Alvio Renzini, Monica Tosi; Publisher, Published for the Space Telescope Science Institute by Cambridge University Press, Cambridge, New York, 1986 ISBN # 0-521-33380-6 LC # QB881 S74 1986. 1986. https://ui.adsabs.harvard.edu/#abs/1986stpo.meet.....N.
Kylafis ND, Norman C. On pumping astronomical masers. Astrophysical Journal Letters v 300, p L73. 1986;300:L73. https://ui.adsabs.harvard.edu/#abs/1986ApJ...300L..73K. doi: 10.1086/184606. Norman CA, May A, van Albada TS. Black holes and the shapes of galaxies. Astrophysical Journal, Vol 296, p 20-34 (1985). 1985;296:20-34. https://ui.adsabs.harvard.edu/#abs/1985ApJ...296...20N. doi: 10.1086/163416. Norman C, Heyvaerts J. Anomalous magnetic field diffusion during star formation. Astronomy and Astrophysics (ISSN 0004-6361), vol 147, no 2, June 1985, p 247-256 Research supported by the European Southern Observatory. 1985;147:247-256. https://ui.adsabs.harvard.edu/#abs/1985A&A...147..247N. May A, van Albada TS, Norman CA. A self-consistent box-shaped galaxy. Monthly Notices of the Royal Astronomical Society (ISSN 0035-8711), vol 214, May 1, 1985, p 131-136. 1985;214:131-136. https://ui.adsabs.harvard.edu/#abs/1985MNRAS.214..131M. doi: 10.1093/mnras/214.2.131. Norman CA. Formation, equilibrium and stability of jets. IN: Unstable current systems and plasma instabilities in astrophysics; Proceedings of the 107th Symposium, College Park, MD, August 8-11, 1983 (A85-48801 24-90) Dordrecht, D Reidel Publishing Co , 1985, p 85-93; Discussion, p 93, 94. 1985;107:85-93. https://ui.adsabs.harvard.edu/#abs/1985IAUS..107...85N. May A, Norman CA, van Albada TS. Secular evolution in galaxies. The Milky Way Galaxy, Proceedings of IAU Symposium No 106, held May 30-June 3 1983 in Groningen, Netherlands Edited by H van Woerden, R J Allen, and W B Burton Dordrecht: D Reidel Publishing Co , p 613, 1985. 1985;106:613. https://ui.adsabs.harvard.edu/#abs/1985IAUS..106..613M. Norman C, Miley G. Jets and emission-line regions. Astronomy and Astrophysics (ISSN 0004-6361), vol 141, no 1, Dec 1984, p 85-90. 1984;141:85-90. https://ui.adsabs.harvard.edu/#abs/1984A&A...141...85N. Norman CA. The galaxy scene and quasat. In ESA QUASAT: A VLBI Obs in Space p 11-12 (SEE N85-16700 07-88). 1984;213:11-12. https://ui.adsabs.harvard.edu/#abs/1984ESASP.213...11N. Norman CA. Magnetic processes during star formation. Frontiers of astronomy and astrophysics, Invited papers presented at the 7th European Regional Meeting in Astronomy, held in Florence, Italy, December 12-16, 1983, Florence: Italian Astronomical Society, 1984, edited by Roberto Pallavicini , p 115. 1984:115. https://ui.adsabs.harvard.edu/#abs/1984faa..conf..115N. Norman C, Silk J. Black halos and dwarf galaxies. Formation and Evolution of Galaxies and Large Structures in the Universe, Proceedings of the 3rd Moriond Astrophysics Meeting on Formation and Evolution of Galaxies and Large Structures in the Universe, La Plagne, France, March, 1983 Dordrecht: Reidel, 1984, edited by Jean Audouze and J Tran Thanh Van NATO Advanced Science Institutes (ASI) Series C, Volume 117, p 215. 1984;117:215. https://ui.adsabs.harvard.edu/#abs/1984ASIC..117..215N. Anderson ER, Norman C, Illingworth G. The orientations of spiral galaxies in the local supercluster. Clusters and Groups of Galaxies International Meeting held in Trieste, Italy, September 13-16, 1983 Editors, F Mardirossian, G Giuricin, M Mezzetti; Publisher, D Reidel Pub Co , Dordrecht, Holland, Boston, MA, Hingham, MA, U S A Sold and distributed in the U S A and Canada by Kluwer Academic Publishers, 1984 LC # QB858 7 C58 1984 ISBN # 9027717729 P 63, 1984. 1984;111:63. https://ui.adsabs.harvard.edu/#abs/1984ASSL..111...63A. doi: 10.1007/978-94-009-6412-9_8. Barthel PD, Norman C, Miley GK. Jets and broad emission line regions. VLBI and Compact Radio Sources Symposium no 110 held in Bologna, Italy, June 27-July 1, 1983 Edited by R Fanti, K Kellermann, and G Setti p 237, 1984. 1984;110:237. https://ui.adsabs.harvard.edu/#abs/1984IAUS..110..237B. Norman CA. Secular dynamical evolution of galaxies. Formation and Evolution of Galaxies and Large Structures in the Universe, Proceedings of the 3rd Moriond Astrophysics Meeting on Formation and Evolution of Galaxies and Large Structures in the Universe, La Plagne, France, March, 1983 Dordrecht: Reidel, 1984, edited by Jean Audouze and J Tran Thanh Van NATO Advanced Science Institutes (ASI) Series C, Volume 117, p 327. 1984;117:327. https://ui.adsabs.harvard.edu/#abs/1984ASIC..117..327N. Pudritz RE, Norman CA. Centrifugally driven winds from contracting molecular disks. Astrophysical Journal, Part 1 (ISSN 0004-637X), vol 274, Nov 15, 1983, p 677-697. 1983;274:677-697. https://ui.adsabs.harvard.edu/#abs/1983ApJ...274..677P. doi: 10.1086/161481. Silk J, Norman C. X-ray emission from pre-main-sequence stars, molecular clouds and star formation. Astrophysical Journal, Vol 272, p L49-L53 (1983). 1983;272:L53. https://ui.adsabs.harvard.edu/#abs/1983ApJ...272L..49S. doi: 10.1086/184115. Norman CA, Heyvaerts J. The final state of a solar flare. Astronomy and Astrophysics (ISSN 0004-6361), vol 124, no 1, July 1983, p L1-L3. 1983;124:L3. https://ui.adsabs.harvard.edu/#abs/1983A&A...124L...1N. Lake G, Norman C. Stellar and gaseous dynamics of triaxial galaxies. Astrophysical Journal, Vol 270, p 51-70 (1983). 1983;270:51-70. https://ui.adsabs.harvard.edu/#abs/1983ApJ...270...51L. doi: 10.1086/161097. Miley GK, Norman C, Silk J, Fabbiano G. X-ray observations of radio-jet galaxies. Astronomy and Astrophysics, Vol 122, p 330-332 (1983). 1983;122:330-332. https://ui.adsabs.harvard.edu/#abs/1983A&A...122..330M. Norman C, Silk J. The dynamics and fueling of active nuclei. Astrophysical Journal, Part 1, vol 266, Mar 15, 1983, p 502-515. 1983;266:502-515. https://ui.adsabs.harvard.edu/#abs/1983ApJ...266..502N. doi: 10.1086/160798. Norman CA. Conflicts and directions in spiral structure. IN: Internal kinematics and dynamics of galaxies; Proceedings of the Symposium, Besancon, France, August 9-13, 1982 (A83-49201 24-89) Dordrecht, D Reidel Publishing Co , 1983, p 163-172; Discussion, p 172-174. 1983;100:163-172. https://ui.adsabs.harvard.edu/#abs/1983IAUS..100..163N. Pudritz RE, Norman CA. Centrifugally driven winds from contracting molecular disks. Bulletin of the Astronomical Society, Vol 15, No 1, p 614. 1983;15:614. https://ui.adsabs.harvard.edu/#abs/1983BAAS...15..614P. Lake G, Norman C. Dust and gas in triaxial galaxies. IN: Internal kinematics and dynamics of galaxies; Proceedings of the Symposium, Besancon, France, August 9-13, 1982 (A83-49201 24-89) Dordrecht, D Reidel Publishing Co , 1983, p 315, 316. 1983;100:315. https://ui.adsabs.harvard.edu/#abs/1983IAUS..100..315L. Lake GR, Norman C. Triaxiality and the galactic center. AIP Conference Proceedings, Volume 83, pp 189-193 (1982). 1982;83:189-193. https://ui.adsabs.harvard.edu/#abs/1982AIPC...83..189L. doi: 10.1063/1.33485. Silk J, Norman C. Dissipational galaxy formation - confrontation with observations. Astrophysical Journal, Part 1, vol 247, July 1, 1981, p 59-76. 1981;247:59-76. https://ui.adsabs.harvard.edu/#abs/1981ApJ...247...59S. doi: 10.1086/159010. Schilizzi RT, Norman CA, van Breugel W, Hummel E. Erratum - VLBI detection of SS433. Astronomy and Astrophysics, Vol 97, P 413, 1981. 1981;97:413. https://ui.adsabs.harvard.edu/#abs/1981A&A....97..413S. Klinkhamer FR, Norman CA. Erratum - massive neutrinos and galaxy formation. Astrophysical Journal, Vol 245, P L97, 1981. 1981;245:L97. https://ui.adsabs.harvard.edu/#abs/1981ApJ...245L..97K. doi: 10.1086/183531. Smith MD, Norman CA. Extragalactic jets. I - trajectories. II - shape and stability. Monthly Notices of the Royal Astronomical Society, vol 194, Mar 1981, p 771-793. 1981;194:771-793. https://ui.adsabs.harvard.edu/#abs/1981MNRAS.194..771S. doi: 10.1093/mnras/194.3.771. Smith MD, Norman CA. Extragalactic jets - part two - shape and stability. Monthly Notices of the Royal Astronomical Society, Vol 194, P 785, 1981. 1981;194:785. https://ui.adsabs.harvard.edu/#abs/1981MNRAS.194..785S. doi: 10.1093/mnras/194.3.785. Lake G, Norman C. Triaxiality and the galactic centre. Formation, Structure and Evolution of Galaxies, Proceedings of the CECAM Workshop, held August 1981 at the Institut d'Astrophysique de Paris Edited by Jean Audouze and Colin Norman Orsay, France: Centre Européen de Calcul Atomique et Moléculaire, p 81, 1981. 1981:81. https://ui.adsabs.harvard.edu/#abs/1981fseg.conf...81L. Audouze J, Norman C. Formation, structure and evolution of galaxies. Proceedings of a CECAM Workshop on Formation, Structure and Evolution of Galaxies, Paris, August, 1981, Paris: Centre Europeen de Calcul Atomique et Moleculaire (CECAM), Universite Paris-Sud, 1981, edited by Audouze, Jean; Norman, Colin. 1981. https://ui.adsabs.harvard.edu/#abs/1981fseg.conf.....A.
Norman C, Silk J. Dynamics and fueling of active galaxies. Formation, Structure and Evolution of Galaxies, Proceedings of the CECAM Workshop, held August 1981 at the Institut d'Astrophysique de Paris Edited by Jean Audouze and Colin Norman Orsay, France: Centre Européen de Calcul Atomique et Moléculaire, p 50, 1981. 1981:50. https://ui.adsabs.harvard.edu/#abs/1981fseg.conf...50N. Klinkhamer FR, Norman CA. Massive neutrinos and galaxy formation. Astrophysical Journal, Part 2 - Letters to the Editor, vol 243, Jan 1, 1981, p L1-L4. 1981;243:L4. https://ui.adsabs.harvard.edu/#abs/1981ApJ...243L...1K. doi: 10.1086/183430. van Groningen E, Miley GK, Norman CA. One-sided jets in extragalactic radiosources. Astronomy and Astrophysics, vol 90, no 1-2, Oct 1980, p L7-L9 Research supported by the Nederlandse Organisatie voor Zuiver-Wetenschappelijk Onderzoek. 1980;90:L9. https://ui.adsabs.harvard.edu/#abs/1980A&A....90L...7V. Achterberg A, Norman CA. Particle acceleration by shock waves in solar flares. Astronomy and Astrophysics, vol 89, no 3, Sept 1980, p 353-362 Research supported by the Nederlandse Organisatie voor Zuiver-Wetenschappelijk Onderzoek. 1980;89:353-362. https://ui.adsabs.harvard.edu/#abs/1980A&A....89..353A. Norman C, Silk J. Clumpy molecular clouds - A dynamic model self-consistently regulated by T tauri star formation. Astrophysical Journal, Vol 238, p 158-174 (1980). 1980;238:158-174. https://ui.adsabs.harvard.edu/#abs/1980ApJ...238..158N. doi: 10.1086/157969. Norman C, Jones BJT. Gas rich dwarfs. "Dwarf Galaxies, The First ESO/ESA Sorkshop on the Need for. 1980:173. https://ui.adsabs.harvard.edu/#abs/1980dwga.work..173N. Forster JR, Goss WM, de Jong T, Norman CA, Habing HJ, Dickel HR. High resolution 4.8 GHz mapping of H2CO using the westerbork synthesis radio telescope. In: Interstellar molecules; Proceedings of the Symposium, Mont Tremblant, Quebec, Canada, August 6-10, 1979 (A81-27676 11-90) Dordrecht, D Reidel Publishing Co , 1980, p 95-97; Discussion, p 98. 1980;87:95-97. https://ui.adsabs.harvard.edu/#abs/1980IAUS...87...95F. Silk J, Norman C. The interaction of T-tauri stars with molecular clouds. In: Interstellar molecules; Proceedings of the Symposium, Mont Tremblant, Quebec, Canada, August 6-10, 1979 (A81-27676 11-90) Dordrecht, D Reidel Publishing Co , 1980, p 165-170; Discussion, p 170-172 NATO-supported research;. 1980;87:165-170. https://ui.adsabs.harvard.edu/#abs/1980IAUS...87..165S. Norman C, Silk J. The evolution of giant molecular clouds. In: Interstellar molecules; Proceedings of the Symposium, Mont Tremblant, Quebec, Canada, August 6-10, 1979 (A81-27676 11-90) Dordrecht, D Reidel Publishing Co , 1980, p 137-148; Discussion, p 148, 149. 1980;87:137-148. https://ui.adsabs.harvard.edu/#abs/1980IAUS...87..137N. Smith MD, Norman CA. Implications of fine scale structure in relaxed double radio sources. Astronomy and Astrophysics, vol 81, no 3, Jan 1980, p 282-287 Research supported by the Science Research Council, Oxford University, and Sterrewacht Leiden. 1980;81:282-287. https://ui.adsabs.harvard.edu/#abs/1980A&A....81..282S. Allamandola LJ, Greenberg JM, Norman CA, Hagen W. The chemical identification of grain mantles by infrared spectroscopy. In: Interstellar molecules; Proceedings of the Symposium, Mont Tremblant, Quebec, Canada, August 6-10, 1979 (A81-27676 11-90) Dordrecht, D Reidel Publishing Co , 1980, p 373-378; Discussion, p 379, 380. 1980;87:373-378. https://ui.adsabs.harvard.edu/#abs/1980IAUS...87..373A. Smith MD, Norman CA. Extragalactic jets: Trajectories structure and stability. Bulletin of the American Astronomical Society, Vol 11, p 656. 1979;11:656. https://ui.adsabs.harvard.edu/#abs/1979BAAS...11..656S. Schilizzi RT, Norman CA, van Breugel W, Hummel E. VLBI detection of SS433. Astronomy and Astrophysics, vol 79, no 3, Nov 1979, p L26, L27. 1979;79:L26. https://ui.adsabs.harvard.edu/#abs/1979A&A....79L..26S. Silk J, Norman C. Gas-rich dwarfs and accretion phenomena in early-type galaxies. Astrophysical Journal, Vol 234, p 86-99 (1979). 1979;234:86-99. https://ui.adsabs.harvard.edu/#abs/1979ApJ...234...86S. doi: 10.1086/157475. Norman C, Silk J. Gaseous halos: Implications for cluster, galaxy, and radio-source evolution. Astrophysical Journal, Part 2 - Letters to the Editor, vol 233, Oct 1, 1979, p L1-L5 NATO-supported research;. 1979;233:L5. https://ui.adsabs.harvard.edu/#abs/1979ApJ...233L...1N. doi: 10.1086/183064. Kormendy J, Norman CA. Observational constraints on driving mechanisms for spiral density waves. Astrophysical Journal, Vol 233, p 539-552 (1979). 1979;233:539-552. https://ui.adsabs.harvard.edu/#abs/1979ApJ...233..539K. doi: 10.1086/157414. Allamandola LJ, Greenberg JM, Norman CA. On the middle infrared fluorescence and absorption of molecules in grain mantles. Astronomy and Astrophysics, vol 77, no 1-2, Aug 1979, p 66-74. 1979;77:66-74. https://ui.adsabs.harvard.edu/#abs/1979A&A....77...66A. Allamandola LJ, Norman CA. Infra-red molecular line emission from grain surfaces in dense clouds. Astronomy and Astrophysics, Vol 77, p 261 (1979). 1979;77:261. https://ui.adsabs.harvard.edu/#abs/1979A&A....77..261A. Roos N, Norman CA. Galaxy collisions and their influence on the dynamics and evolution of groups and clusters of galaxies. Astronomy and Astrophysics, vol 76, no 1, June 1979, p 75-85. 1979;76:75-85. https://ui.adsabs.harvard.edu/#abs/1979A&A....76...75R. Norman C, Silk J. Interstellar bullets: H2O masers and herbig-haro objects. Astrophysical Journal, Part 1, vol 228, Feb 15, 1979, p 197-205 Research supported by the University of California. 1979;228:197-205. https://ui.adsabs.harvard.edu/#abs/1979ApJ...228..197N. doi: 10.1086/156836. Norman CA. Observational and theoretical aspects of gas in early type galaxies. Stars and star systems; Proceedings of the Fourth European Regional Meeting in Astronomy, Uppsala, Sweden, August 7-12, 1978 Edited by B E Westerlund Dordrecht, D Reidel Publishing Co Astrophysics and Space Science Library Volume 75, p 51. 1979;75:51. https://ui.adsabs.harvard.edu/#abs/1979ASSL...75...51N. doi: 10.1007/978-94-009-9440-9_5. Kormendy J, Norman CA. Correlation of galaxy rotation curves and the morphology of spiral structure. Photometry, Kinematics and Dynamics of Galaxies, Proceedings of a Conference held August 6-8, 1979, at the University of Texas at Austin, TX, USA Edited by D S Evans ISBN 0-96-037960-6 Austin, TX: University of Texas, p 445, 1980. 1979:445. https://ui.adsabs.harvard.edu/#abs/1979pkdg.conf..445K. Norman CA, Silk J. On the formation and evolution of clumps of galaxies in an expanding universe. Astrophysical Journal, Part 1, vol 224, Sept 1, 1978, p 293-301 Research supported by the University of California. 1978;224:293-301. https://ui.adsabs.harvard.edu/#abs/1978ApJ...224..293N. doi: 10.1086/156377. Norman CA, Smith RA. Kinetic processes in solar flares. Astronomy and Astrophysics, vol 68, no 1-2, Aug 1978, p 145-155 Research supported by the Miller Foundation and CECAM. 1978;68:145-155. https://ui.adsabs.harvard.edu/#abs/1978A&A....68..145N. Allamandola LJ, Norman CA. Infra-red molecular line emission from grain surfaces in dense clouds. Astronomy and Astrophysics, vol 66, no 1-2, May 1978, p 129-135. 1978;66:129-135. https://ui.adsabs.harvard.edu/#abs/1978A&A....66..129A. Allamandola LJ, Norman CA. Infra-red emission lines from molecules in grain mantles. Astronomy and Astrophysics, Vol 63, p L23-L26 (1978). 1978;63:L26. https://ui.adsabs.harvard.edu/#abs/1978A&A....63L..23A. Norman CA. A non-linear theory of spiral density waves. Monthly Notices of the Royal Astronomical Society, vol 182, Feb 1978, p 457-472. 1978;182:457-472. https://ui.adsabs.harvard.edu/#abs/1978MNRAS.182..457N. doi: 10.1093/mnras/182.3.457. Norman CA. Observational and theoretical aspects of gas in early-type galaxies. Stars and star systems, p A1. 1978:A1. https://ui.adsabs.harvard.edu/#abs/1978sss..meet...A1N. Allamandola LJ, Norman CA. Middle infra-red emission lines from molecules in grain mantles. Stars and star systems, p D7. 1978:D7. https://ui.adsabs.harvard.edu/#abs/1978sss..meet...D7A. Roos N, Norman CA. Collisions between galaxies and their effect on the dynamics and evolution of groups of galaxies. Stars and star systems, p A15. 1978:A15. https://ui.adsabs.harvard.edu/#abs/1978sss..meet..A15R. Arons J, Norman CA, Max CE. Electromagnetic parametric instabilities in an ultra-relativistic plasma. Physics of Fluids, Volume 20, Issue 8, August 1977, pp 1302-1310. 1977;20:1302-1310. https://ui.adsabs.harvard.edu/#abs/1977PhFl...20.1302A. doi: 10.1063/1.862012. Norman CA. Plasma turbulent reactors. Ann Phys (USA), Vol 106, p 26 - 43. 1977;106:26-43. https://ui.adsabs.harvard.edu/#abs/1977AnPhy.106...26N. doi: 10.1016/0003-4916(77)90003-3. Norman CA. Nonlinear spiral density waves. Publications of the Astronomical Society of the Pacific, Vol 88, p 611. 1976;88:611. https://ui.adsabs.harvard.edu/#abs/1976PASP...88..611N. Norman CA, Arons J. Plasma instabilities in radio sources. Publications of the Astronomical Society of the Pacific, Vol 88, p 612. 1976;88:612. https://ui.adsabs.harvard.edu/#abs/1976PASP...88..612N. Norman CA. The generation of relativistic electrons in cas A. Bulletin of the American Astronomical Society, Vol 8, p 545. 1976;8:545. https://ui.adsabs.harvard.edu/#abs/1976BAAS....8..545N. Norman CA. Statistical acceleration processes in relativistic astrophysical plasmas. Pure Appl Phys , Vol 88, p 611. 1976;88:611. https://ui.adsabs.harvard.edu/#abs/1976PApPh..88..611N. Arons J, Norman CA, Max CE. Excitation of the crab nebula by strong waves. Publications of the Astronomical Society of the Pacific, Vol 88, p 603. 1976;88:603. https://ui.adsabs.harvard.edu/#abs/1976PASP...88R.603A. Norman CA. The effects of comptonization and fusion- and decay-processes on the properties of plasma turbulent reactors. Workshop on Electrodynamics of Nonequilibrium Plasmas, Goteborg, Sweden, May-June 1974 Physica Scripta, vol 11, May 1975, p 326-329. 1975;11:326-329. https://ui.adsabs.harvard.edu/#abs/1975PhyS...11..326N. doi: 10.1088/0031-8949/11/5/017. Norman CA, Ter Haar D, Tsytovich VN. Parameter constraints for plasma turbulent reactors. Workshop on Electrodynamics of Nonequilibrium Plasmas, Goteborg, Sweden, May-June 1974 Physica Scripta, vol 11, May 1975, p 323-325. 1975;11:323-325. https://ui.adsabs.harvard.edu/#abs/1975PhyS...11..323N. doi: 10.1088/0031-8949/11/5/016. Karpman VI, Norman CA, Ter Haar D, Tsytovich VN. Relativistic soliton and pulsars. Workshop on Electrodynamics of Nonequilibrium Plasmas, Goteborg, Sweden, May-June 1974 Physica Scripta, vol 11, May 1975, p 271-274. 1975;11:271-274. https://ui.adsabs.harvard.edu/#abs/1975PhyS...11..271K. doi: 10.1088/0031-8949/11/5/006. Norman CA, Ter Haar D. Plasma turbulent reactors - an astrophysical paradigm. Physics Letters, Section C - Physics Reports, vol 17C, May 1975, p 308-358. 1975;17C:308-358. https://ui.adsabs.harvard.edu/#abs/1975PhLC...17..308N. Norman CA, Ter Haar D. Plasma turbulent reactors: An astrophysical paradigm. Physics Reports, Vol 17, p 307 - 358. 1975;17:307-358. https://ui.adsabs.harvard.edu/#abs/1975PhR....17..307N. doi: 10.1016/0370-1573(75)90007-1. Norman CA, Ter Haar D. An astronomer's vademecum for plasma turbulent reactors. Fys Tidsskr , Vol 72, p 84 - 90. 1974;72:84-90. https://ui.adsabs.harvard.edu/#abs/1974FTi....72...84N. Norman CA, Ter Harr D. On the black-hole model of galactic nuclei. Astronomy and Astrophysics, Vol 24, p 121 (1973). 1973;24:121. https://ui.adsabs.harvard.edu/#abs/1973A&A....24..121N.